About 16 years ago, we had an unforgettable vacation in Belize. We’ve always had it on the list of places to come back to and this year we finally got round to it. We decided to go with the same outfit, Island Expeditions out of Pemberton BC. 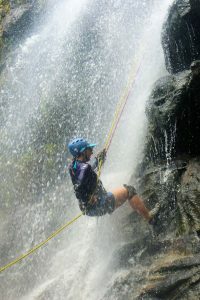 Zip-lined and rappelled down a waterfall in the rainforest. 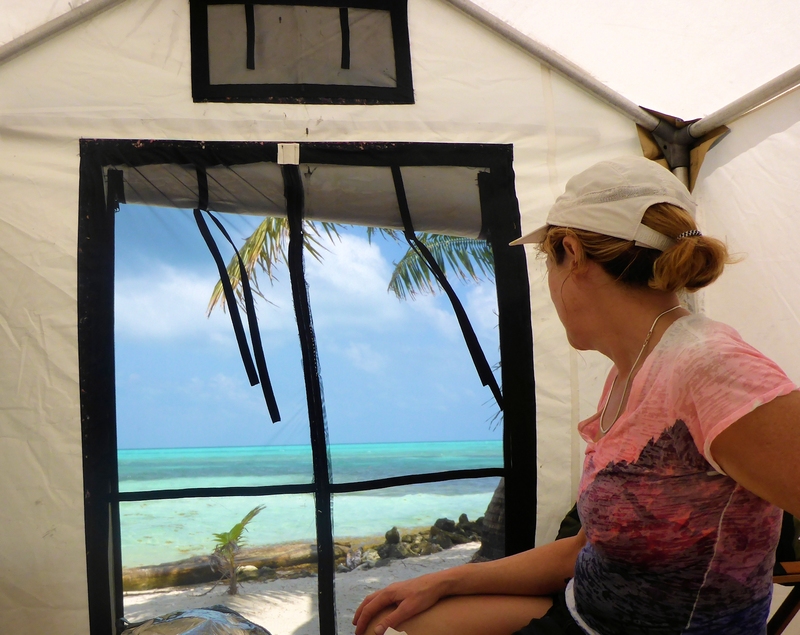 ….and during our downtime did some power-birdwatching, took a drumming lesson, and visited a remote Mayan village where we met and had lunch with family and friends of our guides. Our guides. 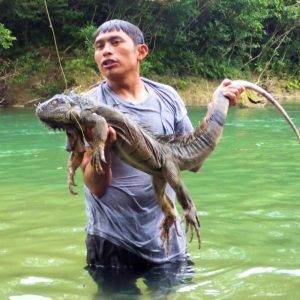 Yes, we should start this trip log with our Mayan guides – Valencio and Pedro. Valencio was our main guide throughout the trip. Pedro was our lead guide on the river. These guys gave it all. Both were great company and a constant source of fascinating information. We must have exhausted them with questions. They made the trip for us. No question. 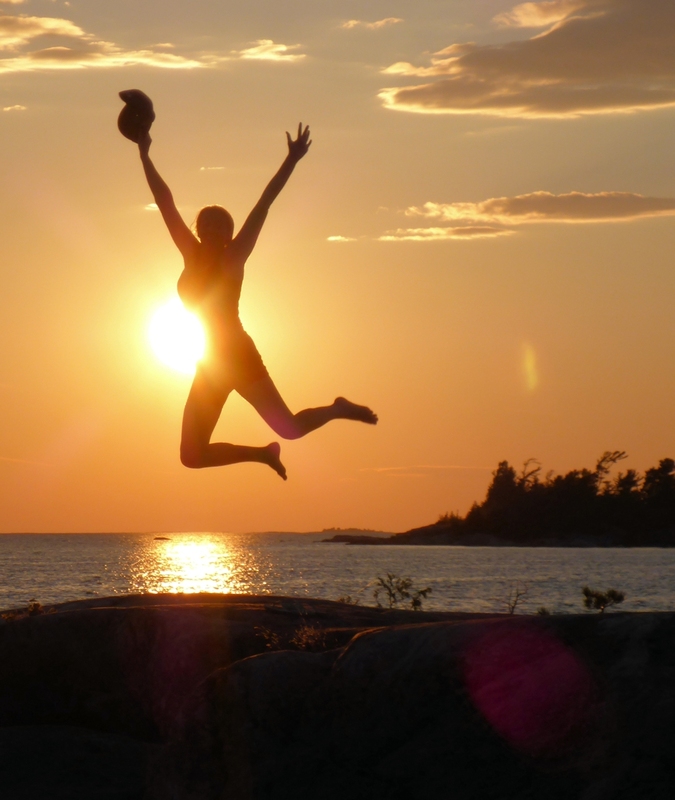 Day 1 we go from Toronto > Atlanta > Belize City > Dangriga. Dangriga is a town in the Stann Creek District in the Southern part of the country, the main centre of the Garafuna people. The town itself has little to recommend it and our lodgings for the night at the Bonefish Hotel was, shall we say, adequate. The main point of being in Dangriga was that is served as a launching point for the first leg of our adventure at Glovers Reef. Except the “launching” got off to an inauspicious start. Our skiff, armed with no less than three Johnson 200 outboard motors, got stuck on a sandbar at the mouth of the estuary from which we disembarked. All able-bodied men were called upon to jump overboard and assist in the work of dislodging the trapped craft – ‘able-bodied’ becoming a term more loosely defined as more clients were obliged to get out of the boat with each successive failure to free ourselves from the mire. After a lot of heave-ho-ing the boat was eventually coaxed over the barrier. We gringos helped I suppose, perhaps not so much with the in heave-ho-ing as the removal of our combined ballast from the stricken vessel. Anyway, amid much laughter and wise-cracking, we got back in the boat (with varying degrees of dignity) and set out on the extremely bumpy ride to Glovers Reef. Glovers is a wonderful site. Located on an Atoll about 20 miles from the mainland. Basic amenities. Safari tents. A nice dining room. 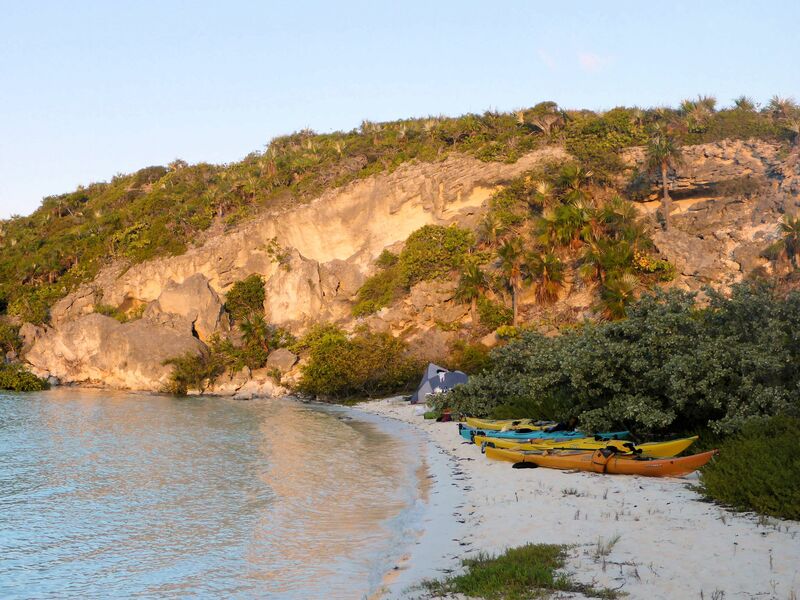 All located in a paradise of palms, sand and turquoise sea. 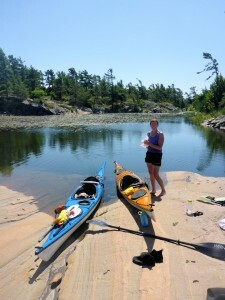 We did some snorkeling, kayaking, kayak-sailing, tried out some inflatable SUPs. Denise and I like to paddle. And good as the snorkeling was, afternoon of day 2 we elected to split off from the rest of the group for a nice long paddle along the reef edge. Cynthia, another member of our group, came with us. On our second evening, we got a demo of traditional Garifuna drumming from one of the guides (“Budge”), assisted by other staff members. Some of us also got a chance to play the segunda (bass drum) while Budge did his thing with the Primera (lead drum). Cool. Day 3 and we’re back in the skiff and on our way to Bocawina. Bocawina is a completely different form of paradise. The soft and lush jungle stood in marked contrast to the sand and salt of Glovers. 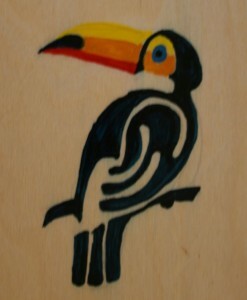 And the birds! Now, we are casual birders. But we are introduced to Blasio. Blasio is not casual anything. Blasio has us out at 5:45AM, coffee in hand, giving us the play-by-play of the local birdlife with his laser pointer like a 1960’s radio commentator. Even the most jaded cosmopolitans in the group are enraptured. This guy was good. 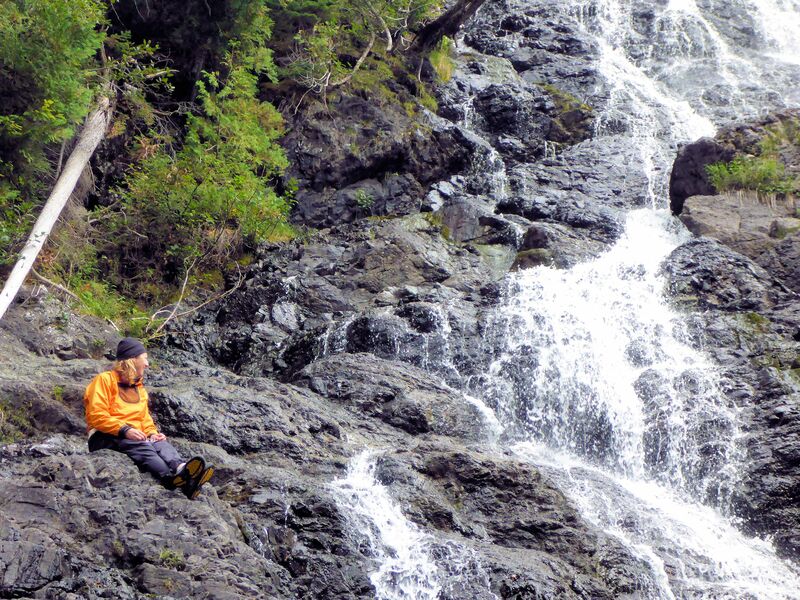 After breakfast, a trek up the mountain to a marvelous swimming hole at the base of a waterfall. Then rappelling down said waterfall. Then some zip-lining. (Once again – the guides were terrific. Safety conscious but lots of fun at the same time). All told, Bocawina was a great spot. The rappelling and zp-ling were great sport but to me, it felt a bit like Disneyland for grown-ups. The restaurant and accommodations were excellent. It was nice to indulge for a bit. But really, I was looking forward to getting on the river. Next day, a LONG haul to the Moho River. Lots of chatter in the van to pass the time. We stopped at Pedro’s house to pick up gear (and say hi to his family). Lunch was laid out by one of the local villagers. Then down to the river. 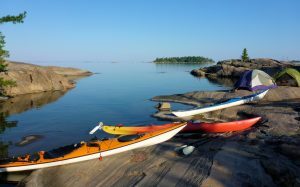 We were using inflatable “kayaks” – sort of a hybrid between a raft, kayak (long, narrow and kayak sitting position) and canoe (tandem, open top and single blade paddle). Following the usual commotion as gear got sorted out, pfd’s and helmets fitted, sunscreen applied, etc. we got on the water and started to get used to the boats. And then, straight into the big stuff! 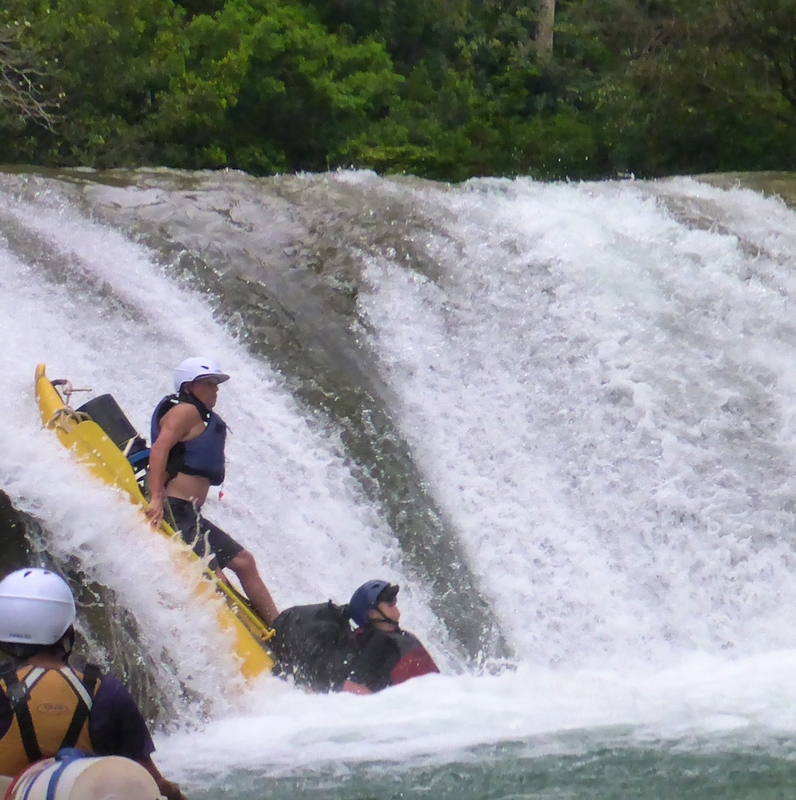 The river’s topography is such that we paddled over 20 drops in the first day. Including an 18-footer. We swam the first couple but once we got a bit more used to the boat, managed to stay right-side-up most of the rest of the time. It was a thoroughly thrilling ride. So much so that I had to stop and look back every so often and remind myself just how beautiful this river was. Camp 1 was in an idyllic spot at the base of a set of falls. No bugs! It almost felt wrong to be walking around in short sleeves unprotected. Early next morning we were awakened by the spine-chilling roar of howler monkeys. We scrambled out of the tent and managed to spot a group high in the trees. Packed up and on the river for another day of white water. Lunch at the top of a waterfall that afterwards had to be paddled solo. Denise was persuaded to take our boat over. I simply tossed my paddle, jumped off the ledge into the deep pool at the bottom and got back in the boat there. It was that kind of day. Camp 2, also beautifully situated. That evening, Pedro cooked some chicken, although that doesn’t begin to do justice to the culinary miracle we witnessed. He got a fire going. We off to cut down some cohune palm; spread out the woody stalks as a grill; seared the meat; and then laid the rest of the palm leaves on top and let it slow-cook for about an hour. Best chicken ever. It didn’t hurt I suppose, that these chickens were probably running around his farmyard until shortly before our arrival. Last day on the river was more of a gentle paddle. A chance to spot some birds and bond with an iguana or two. Pedro pointed to loose branches high up in the overhanging trees. Incredibly, this was the river’s high-water mark in the wet season. Eventually gaps began to appear in the bush and signs of human habitation began to re-appear. Finally, a concrete causeway intruded on the landscape to mark the end of an unforgettable adventure. It had been a while since we did any Still Life work in the class so I decided to kick off this semester with a demo. The urn cost me all of $4 at the local Vincent DePaul outlet. The demo took a little over 2 hours to complete. 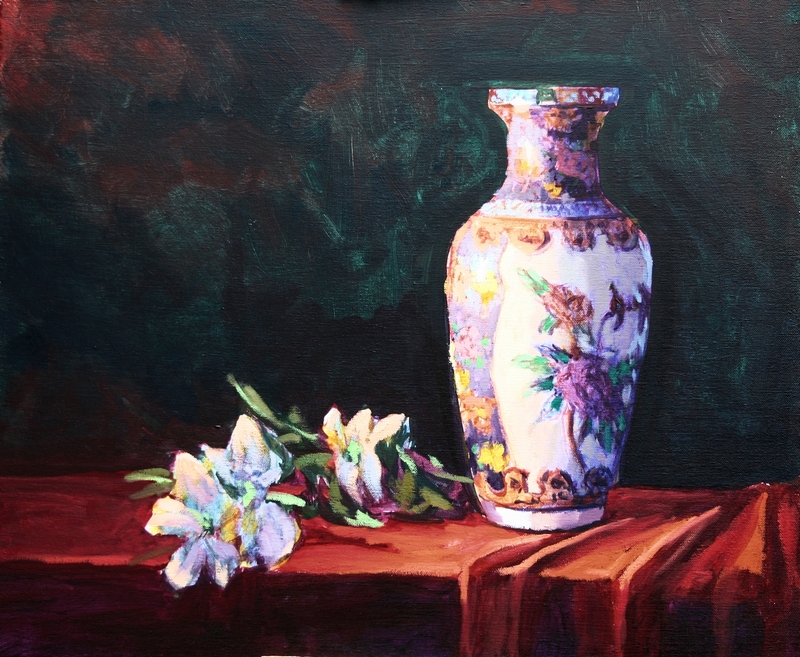 The idea I wanted to convey was this: Give someone a plain object to paint, and they will usually do all the usual things to model the form with light and shadow to give it volume – (sometimes even when such modeling is not warranted). Give the same person a patterned object however, and often, the modeling of light and dark is forgotten or relegated in favour of the lights and darks of the pattern. The result – a two-dimensional depiction. This is not a bad thing in itself (think Matisse for example), but what if you want a want to show a fully modeled form? This is what I wanted to demonstrate on Monday night. To emphasize the point, the vase had sections with a black background and sections with a white background. I turned the black section towards the spotlight. The key to successfully modeling a patterned object like this is to ensure that the values you use for any given area are guided in the first instance by the light falling across the surface of the object in its entirety and only secondarily by the local values dictated by the pattern. In this demo for instance, there are places where the paint used to depict some of the fully-lit “black” areas is actually lighter than the paint applied to some of the “white” areas that are in shadow. This is an interesting exercise to try out and a great way to develop a mindset that constantly questions what we are really seeing in front of us. 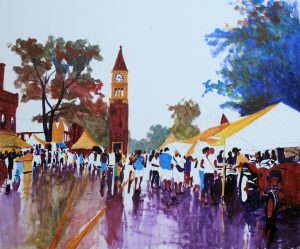 Visiting some friends in NOTL during the annual Peach Festival, I brought my camera along in the hopes that the summery festive crowd scenes would yield some subject matter for a painting or two. However, Mother Nature sent a torrential downpour instead. But once the rain eased up, the late afternoon lighting provided some nice dramatic atmosphere as determined festival-goers returned to the stalls. Starting with a sketch. The WW1 memorial clock tower forming a centre piece; Road markings creating some interesting design; A big red antique tractor on the far right is interesting, but I will have to be careful not to let it drag the eye out of the composition. Blocking in colour using acrylics. Keeping the paint thin. Not too worried about getting colours or values exact at this point. 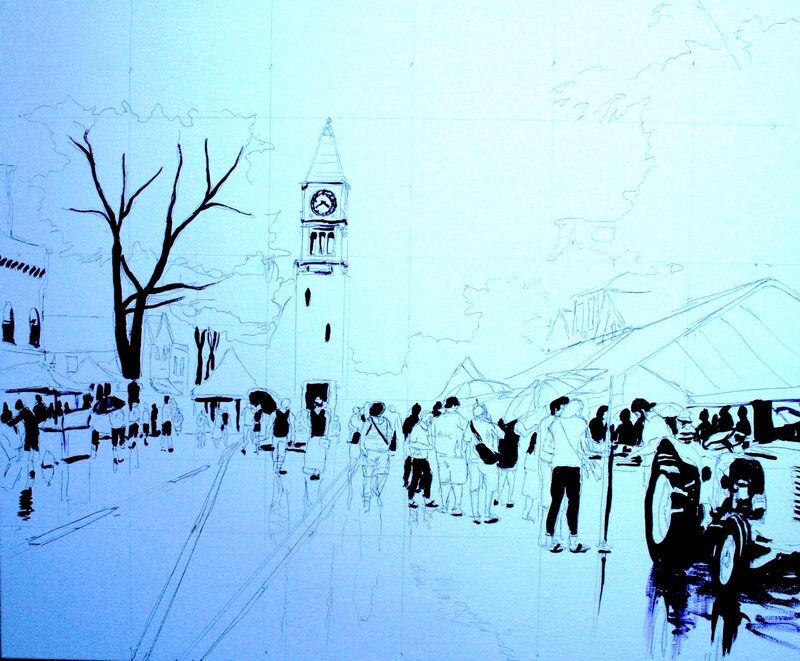 Main objective is to cover the white of the canvas as quickly as possible. The tree on the right is a large dark mass and risks overweighting this side of the composition. 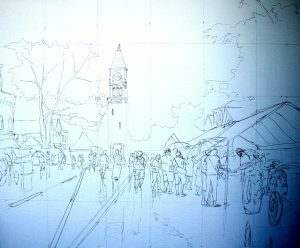 I find using blue in the underpainting helps to make the volume recede and feel less massive. Canvas is covered. Time to start deepening tones. 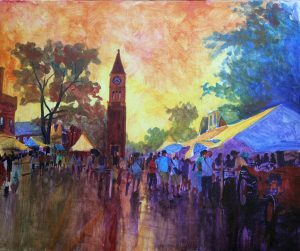 Colours are all much warmer than the palette intended for the final piece. Final stages of the underpainting. 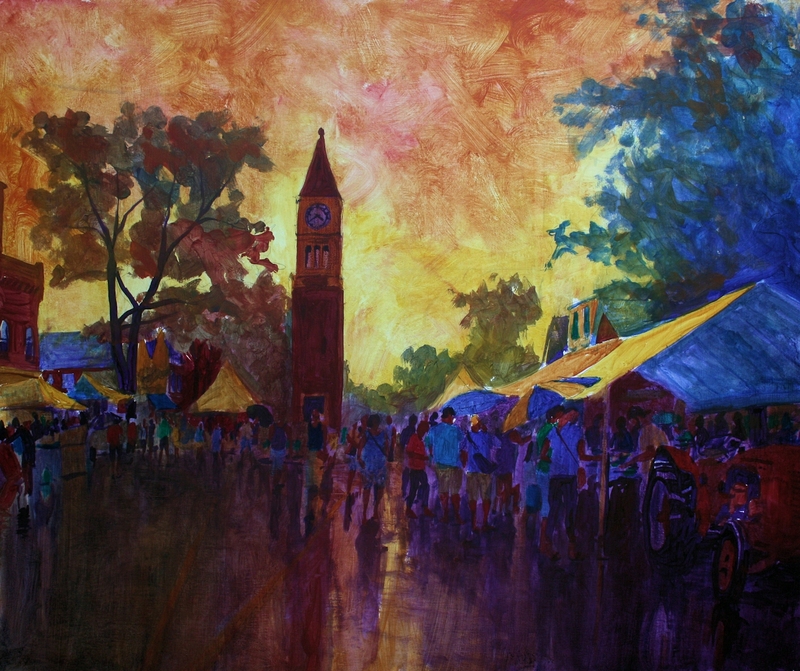 Ideally, no area in the painting should require further darkening at this point. Now to oils and straight to the highlights – the bright awnings – and the sky. 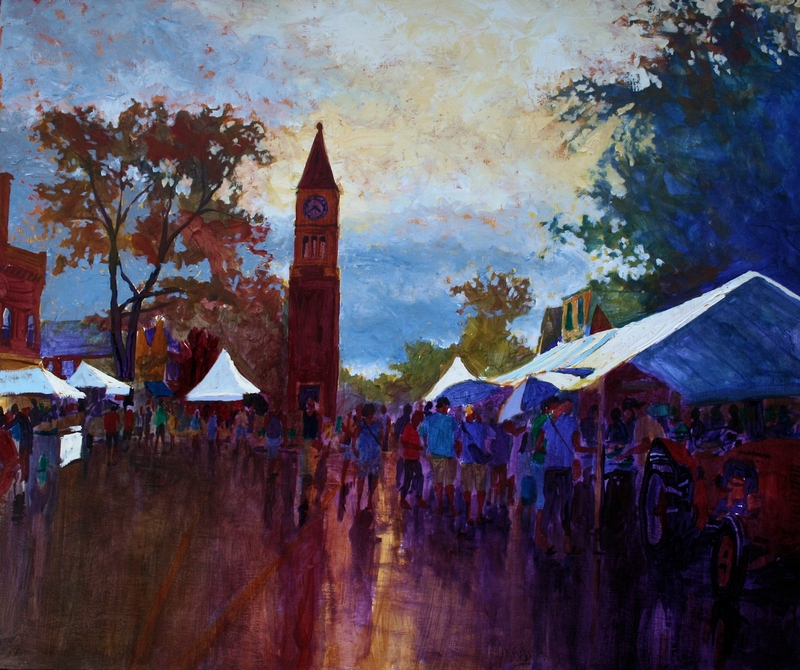 I have now bracketed the tonal range of the painting. Everything else from now on should fall between the lightest lights and darkest darks already established. 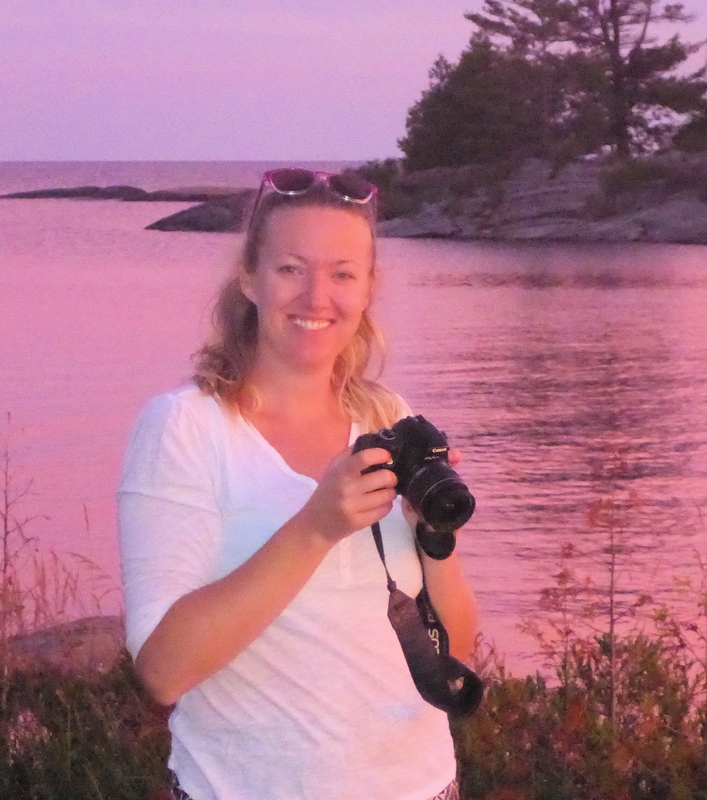 A return to one of our favourite haunts on Georgian Bay, but this time with our daughter, Aisling accompanying us. On this occasion, Georgian Bay displayed a much kinder, gentler side of its personality than usual. 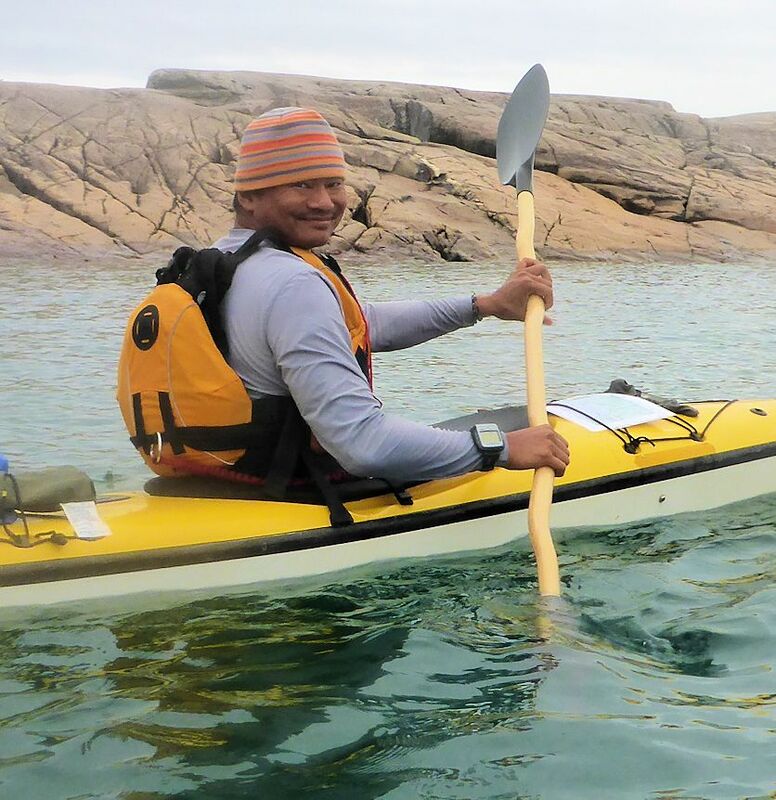 Previously, trips out to the Minks have been characterized by a hard 7km slog against the prevailing Westerlies. On at least one occasion the gales exceeded our abilities and we had to settle for plan B for a weekend. On this trip however, the winds never seemed to exceed 10km/hr and at various times came from all four points of the compass. We then headed back to the put-in at Gillies in Snug Harbour. When it came to packing the boats, the third kayak gave us a bit of extra room. So even though we were packing for a 4-day trip, we managed to get the boats in the water pretty quickly. 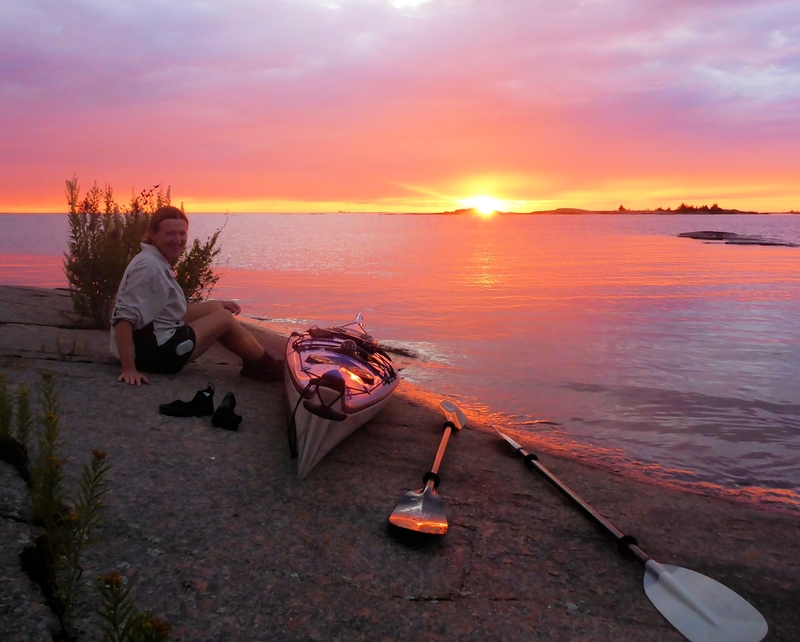 The first leg of the trip was the short paddle across the Shebeshekong Channel to the bottom of Franklin Island. Given the late start, the plan was to camp somewhere around Henrietta Point. When we got there however, we found site after site had been taken. We had never seen the place so busy. We continued up the coast and settled on a spot around Windsor Island. Although it lacked curb appeal and the take-out was a bit of a challenge, the site was reasonably secluded and actually worked out very nicely. Dinner was followed by a spectacular sunset. 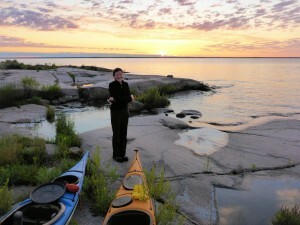 Next morning, we packed up for our trek out to Green Island, our landing spot in the Minks chain. 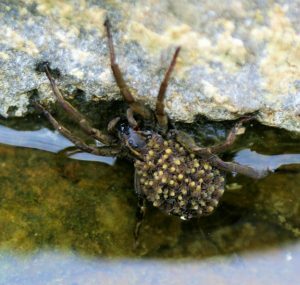 Getting everything in the boats took just as long as the take-out the night before and the whole exercise was extended with Aisling’s discovery of a large female wolf spider carrying her spiderlings on her back. Needless to say, a subject such as this had to be studied, photographed and fully researched before we could finally put the boats in the water and get under way. The trip over to Green is about 6.5km across open water, but on this occasion with the wind behind and to the North of us – an easy crossing. All we had to do was to aim north a bit to compensate for the southward drift. We made landfall in under 90 mins. Even out here, it was busier than usual, with three parties on Green itself. We were sufficiently spread out though, that it felt like we had the place to ourselves most of the time. Later in the afternoon, the weather closed in and we had some rain. It cleared up in time however to provide another incredible sunset. (This trip was really memorable for the sunsets). Some rain again in the morning but it cleared up soon enough. We spent a couple of hours exploring the adjacent islands (Rapier, Wallbank, Goodkey etc.) on absolutely still waters under clear skies. 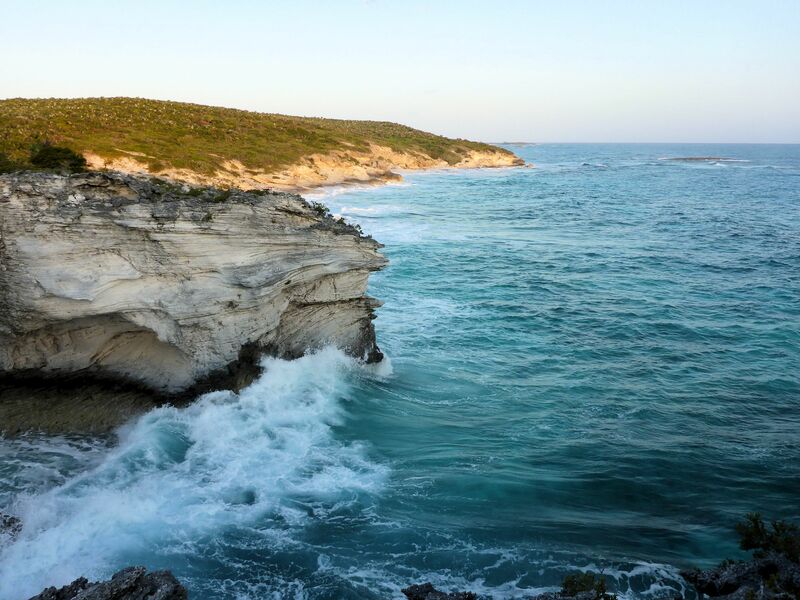 It might have been the Caribbean, with fresh water instead of salt, and smooth rock for sand. The word ‘paradise’ was used a lot. We could have dallied here forever, but finally, it came time to head back to Franklin. After extensive debate about bearings and landmarks, we finally settled on a target to aim for and made our way across. 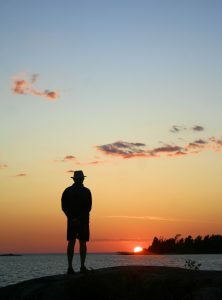 This time, we were going to explore further up the west coast of Franklin, in the vicinity of Speers or Winkler Island. Again, we had an easy crossing, landing directly on Winkler. It’s Monday now, but there is still a fair amount of activity in the area. We explored the area around our landing spot and decided it was our ideal location for the night, with some spectacular views from headlands next to our site. It’s hot now, and all activity is punctuated with quick dunks in the water to cool off. 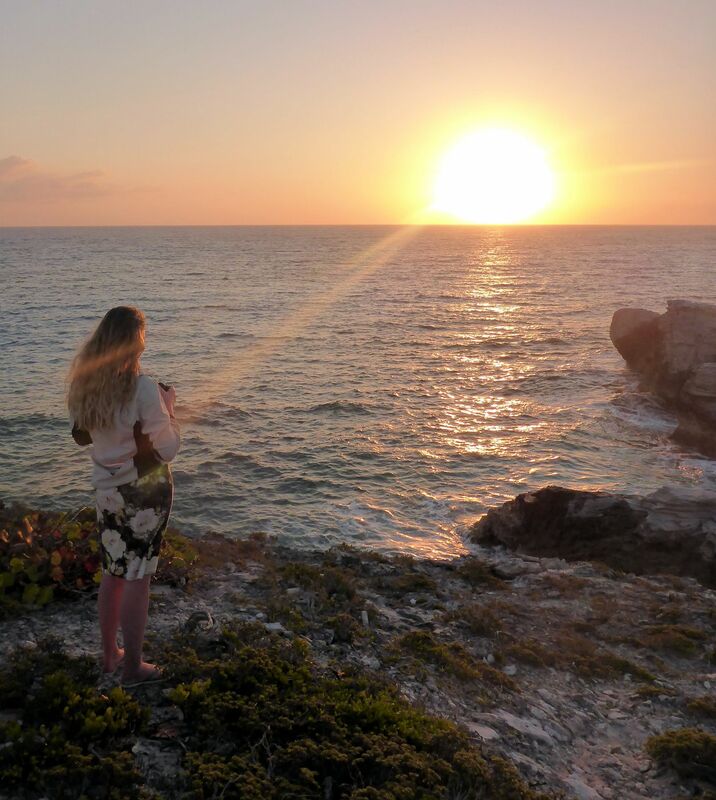 The evening was capped off with another incredible sunset followed by stargazing and satellite and meteor spotting. Denise and I retired for the night while Aisling persevered in trying to turn the local frog into a superstar by allowing itself to be photographed catching a mosquito with its tongue. Ultimately in vain however; The frog apparently valued its anonymity. The trip back to Snug Harbour was only about 7.5km so there was plenty of time on Tuesday for goofing off. Aisling and I tried rolling the kayaks. Aisling successfully. Me? Well, let’s just say I’ll be booking some pool sessions again this fall. After a slow and reluctant pack-up, we headed back to Snug, motivated only by the thought of a cold beer and fish and chips at Gillies. 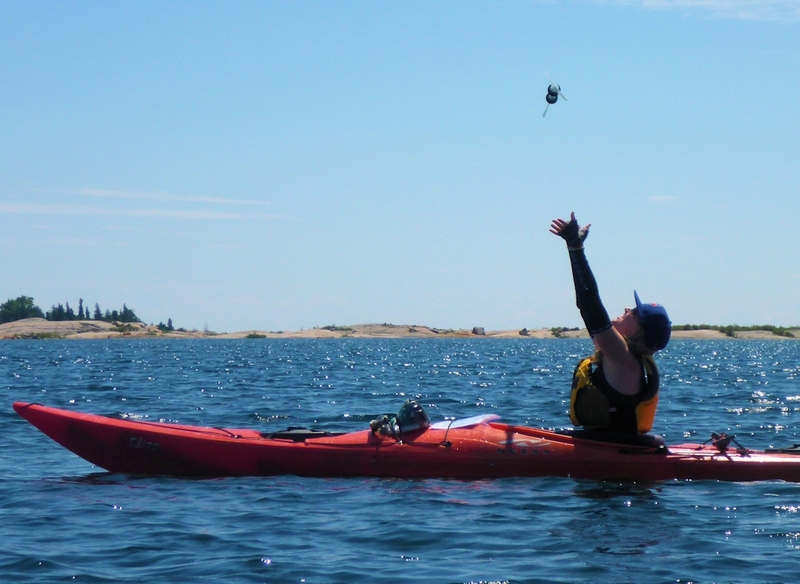 You can gets lots into three kayaks! Some good friends invited us to spend some time with them at their beautiful condo in Florida. It was February in Ontario. It was an offer too good to refuse. But such decadence called for a counterpoint. 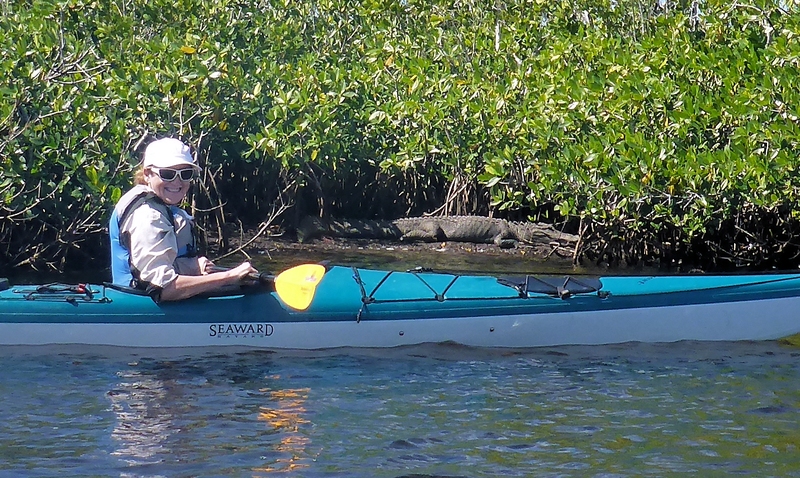 I thought five days in a swamp ought to just about do it, so we booked a guided trip through the Everglades with a local outfitter – Florida Outdoor Adventures. Day 1, we set off early for the drive down to Everglades City to meet our guide, Dave, at 9:00am at the Everglades Visitor Centre. As always, packing up the boats for the first time took some time sorting out, but soon we were on the water. 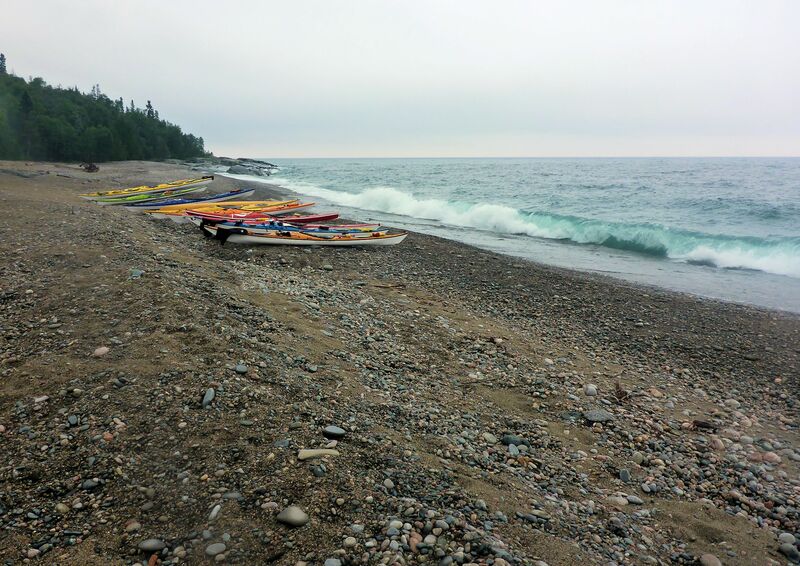 As we paddled for a while along a busy channel that led out past the town of Chokoloskee, a few differences were noticeable between paddling in this part of the world vs the Great Lakes. Saltwater obviously-or brackish water at least. So we carried our drinking water with us. Above all – the lack of solid land. Mangrove islands created an illusion of topography – but up close – there were few places one could put one’s foot down on dry land. Oyster beds provided some of the few places you could get out to stretch your legs and so it was on one of them that we took a break for lunch. As we did so we were entertained by some dolphins that had come by to give us a closer inspection. The only other bit of terra firma to be had in the area is in the form of shell mounds – ancient middens established by native peoples that provided just enough elevation to clear high tide. White settlers used some of these to establish holdings in the area although none survived very long. We stopped off at one of these shell mounds, known as Lopez’s Place, to stretch and take a look around. There were remnants of a couple of concrete cisterns, used to collect fresh water in the wet season, and not much else. Apparently the occupants abandoned the site after several seasons of having their freshwater supplies polluted by storms. First night was spent on a “chickee” at Crooked Creek. 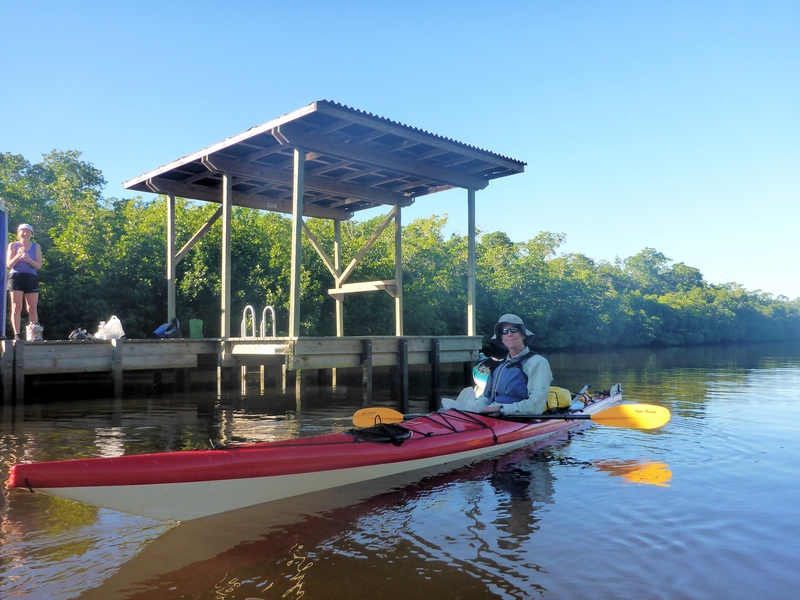 A chickee is just a native word for “house” – but in the Everglades, it refers to a wooden platform set up in the water to accommodate a couple of tents and a few square inches to set up a stove and have dinner. 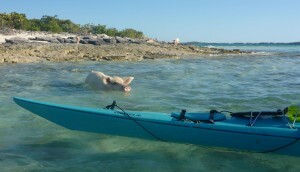 Getting out of a kayak onto a chickee, especially at low tide, can be a challenge. The platforms are supposed to accommodate up to 6 people. We were just three, and it felt like a tight squeeze. 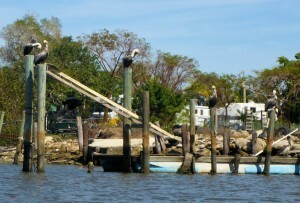 The chickees are set up in pairs with an adjoining boardwalk, upon which sits a porta-potty. (As an aside, most of the porta-potties we encountered on our trip were in a disgusting condition – a significant negative in our overall impression of the Everglades park system). Our adjoining chickee had a single occupant, Ben. He was on the last night of a 7 or 8-day trip from Flamingo and at this point seemed to want nothing more than to set his feet on some dry land. That evening, we were treated to a beautiful sunset before we retreated into our tents to escape the mosquitoes. Next morning we struck camp, reversing the previous evening’s process to get all our stuff back into the kayaks, and headed south to our next destination – Watson’s Place. Watson’s is another shell mound site. 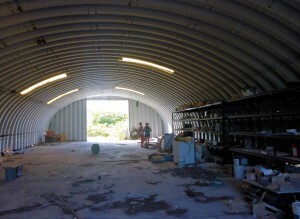 A large one – supposedly extending over almost 40 acres. 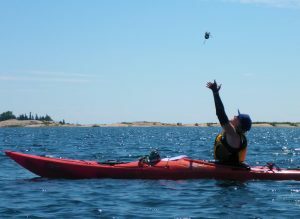 As we paddled we encountered lots of birdlife. There were ospreys everywhere, as well as herons, egrets and ibises. More dolphins. 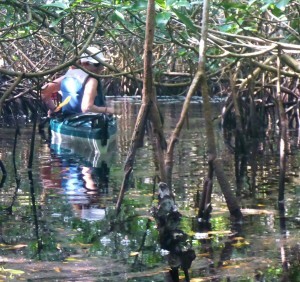 They seemed strangely out-of-place in these mangrove channels that looked and felt more like rivers and tidal channels. 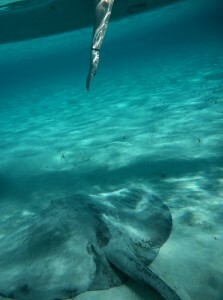 Water temperatures were on the low side for manatee but we did catch a glimpse of one. At Watson’s place, we were joined by a class of high-school students and their teacher. The kids were a delight – a real credit to their teacher. That evening, Dave fried up a batch of alligator tail which we shared with our neighbours. Sean, one of the kids whose turn it was to be cook for the night, insisted on sharing some of his peanut stir-fry concoction in return. 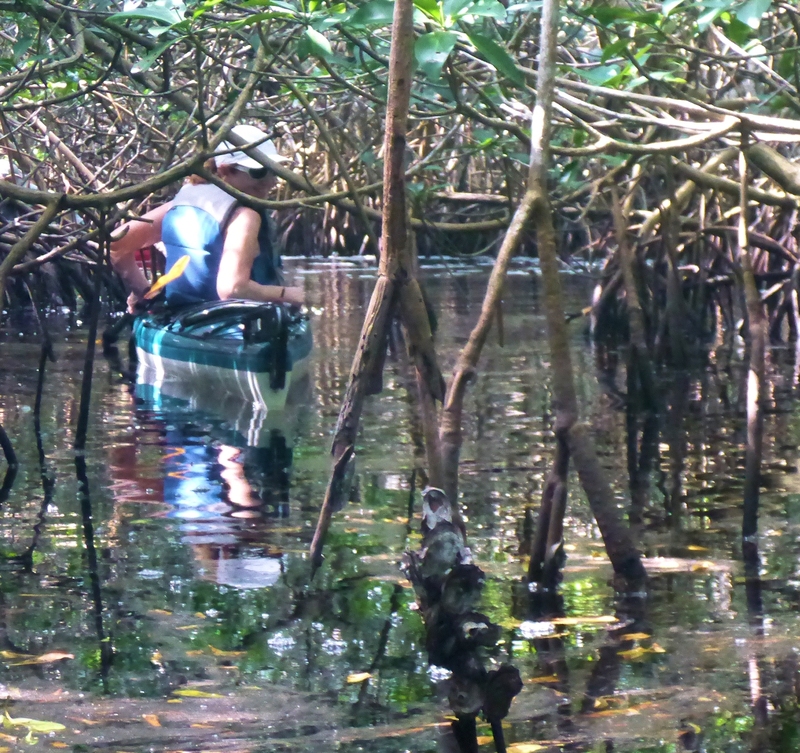 and navigated some tight mangrove tunnels – on occasion prompting some colourful language from yours truly. 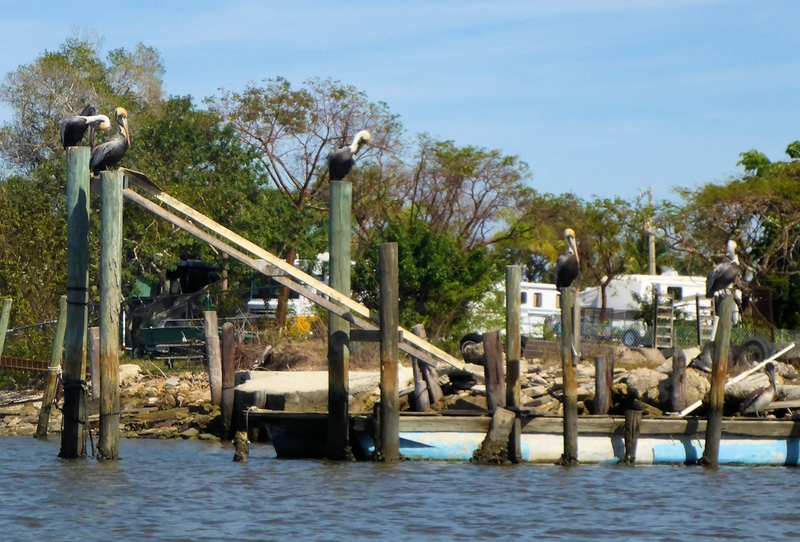 We lunched at a chickee in Sweetwater Bay, chatting with a couple of fishermen – Bill and Bob (their real names) – from Miami. Bob proved himself man of the hour when he pulled out three beers from his cooler – including a cold Guinness for me God bless him! Back at Watson’s the kids had spent the day doing school work. That night, in a stealth operation worthy of some Navy Seals, they broke camp and without a word were gone well before dawn. 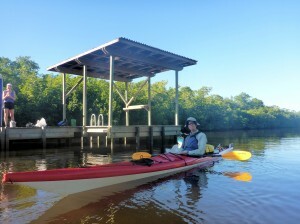 Day 4 we set off for Pavilion Key – a big change from the mangrove channels we had been paddling through so far. There were several groups on the island that evening, but there was lots of room to spread out. A beautiful 2km-long beach provided a welcome opportunity to exercise the legs. That evening, we watched huge flock of plovers, sandpipers and other waders along the shoreline. Early morning, we were greeted with a powerful storm. Our exposed tent took a fierce pounding for about an hour before it finally blew over. We were grateful the storm hit when it did and not two hours later when we would have been caught out on a very open stretch of water. As it was, the wind had died down completely by the time we broke camp. All that remained now was the long paddle back to Everglades City. Early afternoon, we rounded a bend, and we saw our first sign of human habitation. 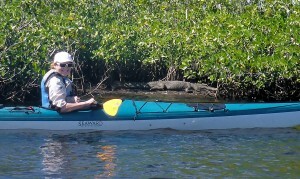 We stopped off at Chokoloskee for a shore lunch and then finally back to the take out at the Everglades Visitor Centre. Overall impression: An interesting trip in a very unique ecology. Not a world-class kayaking destination in my view but worth checking out if you are in the region. 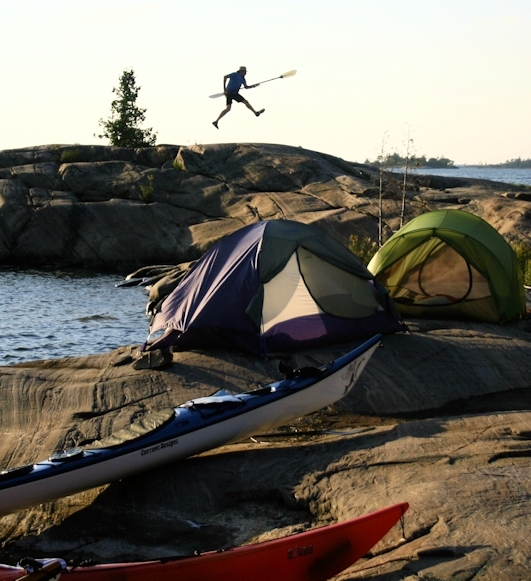 Earlier this year, we signed up for a 10-day Lake Superior trip organized by Harbourfront Adventures. The itinerary comprised a 5-day trip from Rock Island lodge, at the mouth of the Michipicoten River to Denison Falls (on the Dog, or University River)and back, book-ended by several day trips from the lodge itself. 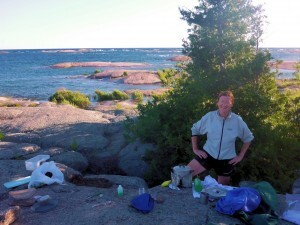 Denise and I had been to Lake Superior Provincial Park back in 2009. This time, we felt a guided trip would give us an opportunity to venture further than perhaps we might risk by ourselves, and of course also give us a chance to meet some fellow travelers. We all met for the first time for a pre-trip gathering at the Harbourfront Canoe & Kayak Centre in Toronto. Nine clients and four guides (Liz, Biz, Eric, and Lien). Various travel and accommodation options were offered. 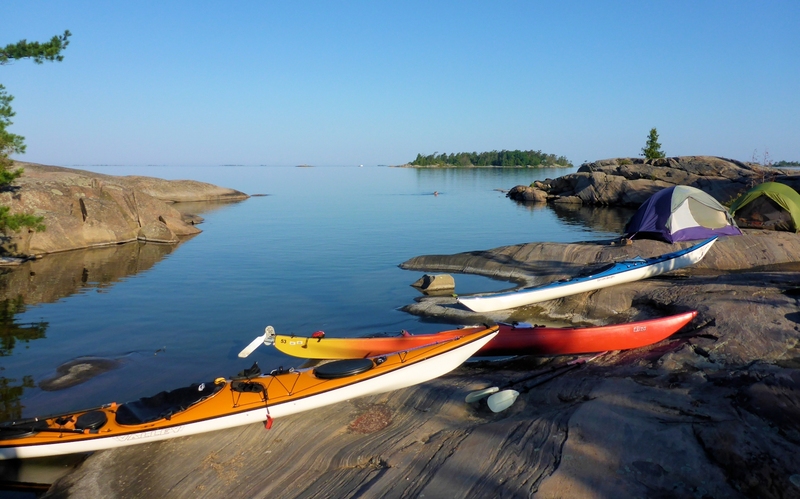 We chose to have Harbourfront take our kayaks to Rock Island lodge for us, allowing us to fly to Sault Ste Marie and then be picked up by the guides for the 2-hour drive to Rock Island Lodge. 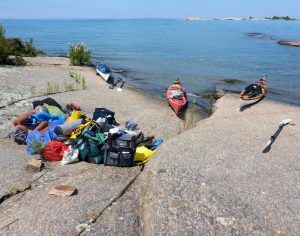 We packed our tents, sleeping bags and paddling gear in the kayaks to minimize the amount of stuff we had to take on the flight. As the gang gathered round at the Soo airport, re-introducing each other as we waited for our ride to the lodge, the first seeds of crew nicknames began to germinate. By the closing days of the expedition these had blossomed into a full roster of “CB handles” – “Dice”, “Day Hatch”, “Hotsauce”, ‘Wiz”, “Eggplant”, “the Brain”, “Swee’Pea”, “Tiny”, “Cookie”, ‘the Captain”, “XO” and so on. Each a story in itself. 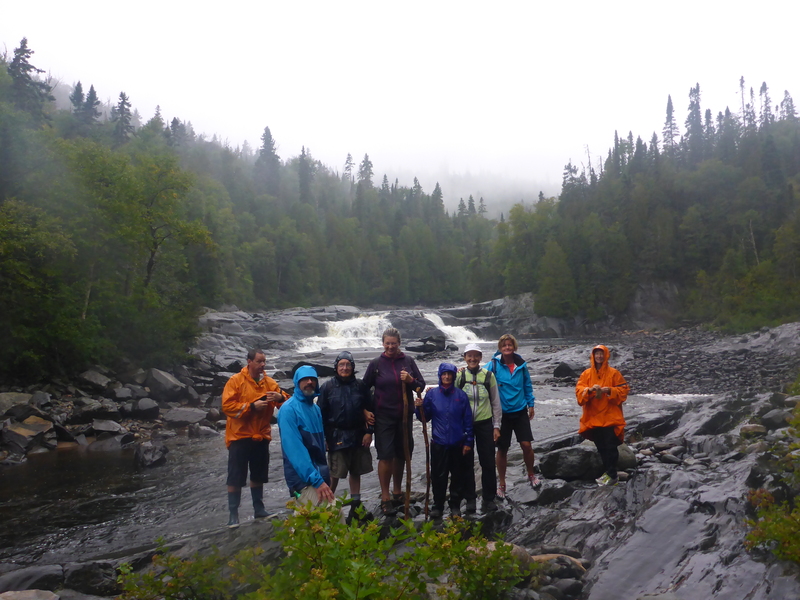 Our guides arrived and we piled into two vehicles for the drive to the lodge, stopping at the Agawa Rock Visitor Centre for lunch. The last leg of the trip was occupied with a group effort to complete the Globe & Mail crossword – and the Captain whispering answers to Hotsauce in the back seat. By the time we got to the lodge and got settled in, there was just enough time for a short hike up to nearby Silver Falls. 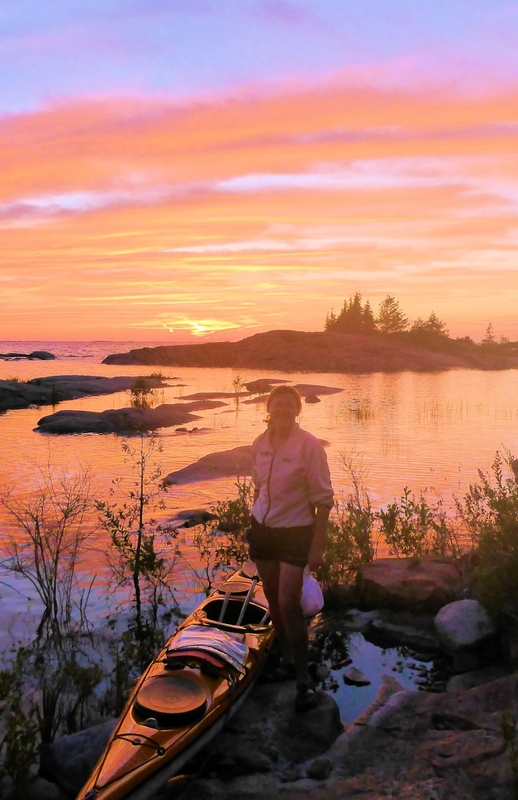 Next day we did a short paddle along “Government Beach” and up the Michipicoten River to the base the falls we had hiked to the pervious evening. But the day was mostly about getting sorted out with the boats and practicing some maneuvers . We did get quite close to some bald eagles though, and that evening, were treated to a display of northern lights. Dice, our team meteorologist also gave us an orientation to some of the major star constellations. 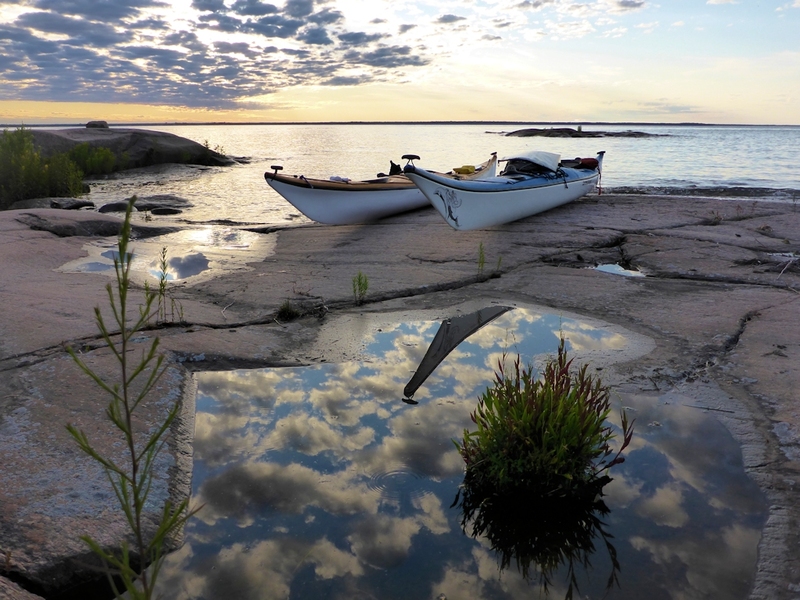 Next morning we packed up the boats in earnest and set out on our 5-day expedition. The weather was beautiful and the water totally calm. The pace was leisurely, with plenty of time to goof around and practice our synchronized paddle tosses; We stopped for lunch and water-Frisbee near a spot called Indian Beach; The mood temporarily darkened when one of the gang slipped and dislocated her shoulder. Luckily, Denise was able to reset it without much trouble. 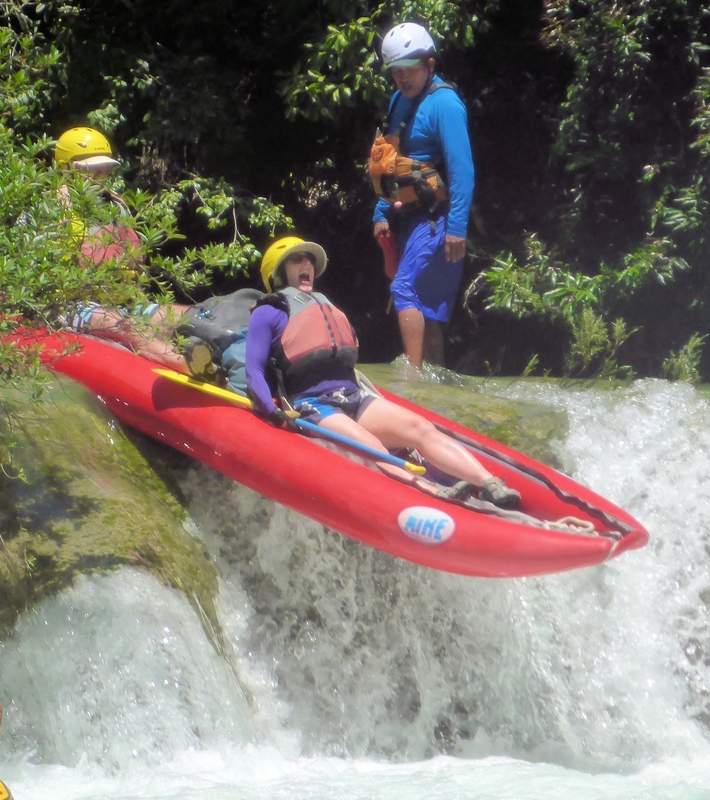 After reluctantly agreeing to allowing herself to be towed by Eric for a while to give her shoulder a chance to heal, our patient was able to carry on and enjoy the rest of the trip. Our first campsite was at Minnekona Point and comprised a couple of small beaches tucked in between two rock outcroppings. 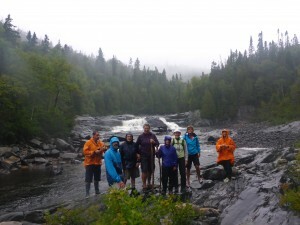 In all, we covered about 14km the first day – about half the distance to the Dog River. Lien (“Cookie”) was our master chef throughout the trip – and master chef he was. This evening, it was clear that the culinary standards we had enjoyed so far at the lodge were not going to be compromised in the bush. This was not going to be a Kraft dinner trip by any stretch. Next morning was again calm. Lunch was on a lovely beach at a spot called McCoy’s Harbour, although there was nothing but some iron rings embedded in a rock to suggest there had ever been any man-made structure there of any kind. Once sufficiently fed and watered, we carried on for the final leg to the Dog River. Luckily, the water remained calm for our landing at our final destination, which was just as well. The beach at the mouth of the Dog is wide, stony and ‘dumpy’. We got a vivid illustration of this from shore the next day as the wind picked up. It was a great chance for Eric to demo his surfing moves, but the rest of us mortals would have been severely challenged had these conditions prevailed when we were trying to take out the previous day. 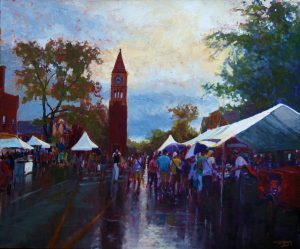 The day brought not just wind but rain. Lots of it. The hike to Denison falls was just a couple of kilometers, but the footing was treacherous almost all the way and in the end, we settled for a few photos at the foot of the lower falls before heading back to camp to dry out and warm up. Miraculously, the next morning was calm again for the first leg of our return trip. We were however, almost totally fogged in. We paddled in the eerie stillness, close to shore, and to each other, until we made our way back to Minnekona point. The last day of our back-country expedition was overcast. The air and water were completely still as we started to make our final crossing from Perkwakwia Point to the mouth of the Michipicoten. Then Dice, our weatherman, announced that all hell was about to break out in about 15 minutes. Sure enough, as we paddled the last few hundred meters, the winds picked up, the rain came down and we started to hear the first rumbles of thunder. No dawdling then, as we quickly pulled our boats ashore and made for the sanctuary of the lodge. One full wall of the dining room at the lodge is comprised of big picture windows overlooking the bay. From there, with mugs of chicken noodle soup in hand, we watch in awe as the storm set in. Next day was a so-called rest day, with an option for a trail hike. Denise decided we were taking the option. What was supposed to be a 3-hour stroll somehow mutated into a 5-hour death march. To begin with, there was a turn off near the beginning which we missed. Twice. Eventually we located it. Completely overgrown. As was most of the rest of the trail. By the time we made it to Government Beach the search parties were out. After a late lunch, we watched Eric and Liz do some surfing at the mouth of the river. 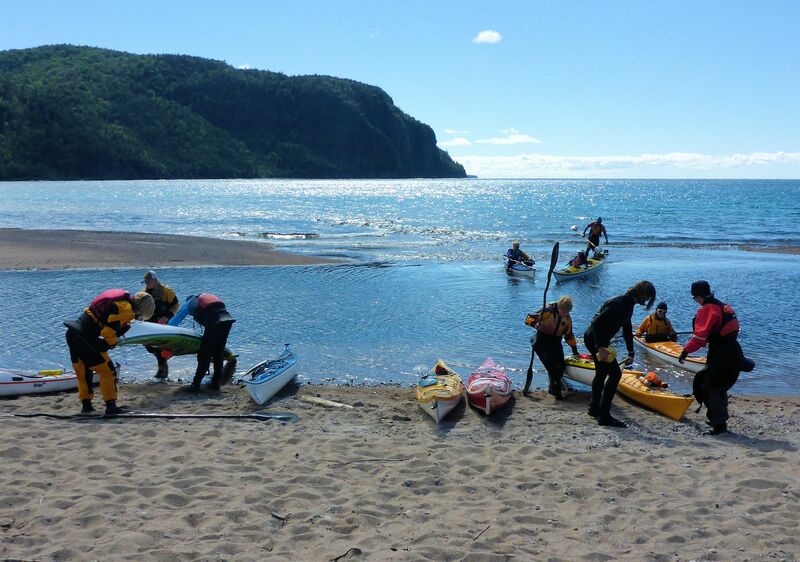 We death-march survivors were too tired to get back in the water, but one brave soul got into her kayak and ventured into the surf – a venture which instantly morphed into an impromptu demonstration of an assisted rescue. Next day – Gargantua Bay (pronounced Gargan-twa by the locals) was on the agenda, including a paddle along the cliffs of Devil’s Warehouse, and a visit to the sunken wreck of the Columbus – a 136-foot barge that has laid submerged in 30 feet of water at the north end of the bay since 1909, the year it caught fire and was cut loose from its moorings to prevent the fire spreading to the remaining buildings on shore. Those buildings are gone now and there are few other signs of human activity remaining. By the time we got back to the take-out, the waves had picked up a bit. The beach there is steep and comprised of large cobble – perfect boat-crunching material. Eric and Lien went ahead. They used two big logs as an improvised landing pad onto which they launched us one by one as we came in! Back to the lodge and another splendid dinner. We rounded out the evening by breaking out the guitar and taking a stab at some old tunes with some assistance from Lien and UltimateGuitar.com :)). 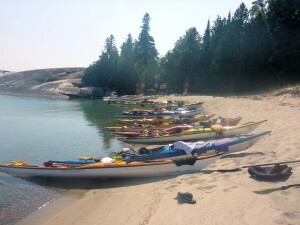 Old Woman Bay was the destination for the final day trip. 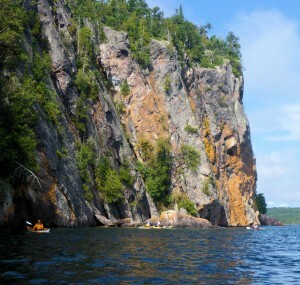 We headed south along the magnificent 400 ft high cliffs to a small cobble beach. From there it was a short stroll to the very pretty Till Creek Falls. We would have rounded out the day with a very pleasant incident-free paddle back to the vehicles except Eric decided this was a good time to try some rock climbing while wearing his kayak. Several of us heard the crunch. “Oh, oh. Watch my waterline”, he says. Not sure if he’s serious or not, I turn to Lien. “I think Eric’s holed his boat”. Lien throws his eyes up with a look of resignation and continues to paddle. “Not the first time”, he says. Sure enough, back on shore, Eric’s back hatch is 3/4ths full of water, although he seemed pretty confident he would be able to patch it up back at the shop. Next morning, back to the Soo and back to Toronto. It’s raining now. We left in shorts and T-shirts. Now it feels like winter is just round the corner already. Looking forward to meeting the gang again for our post-trip meeting – and maybe planning our next adventure. First Georgian Bay kayaking trip of the year. We set out late Monday afternoon. We would be getting to our destination too late to put boats in the water, so we camped the first night in Kilbear Provincial Park. Some heavy rain as we approached Parry Sound, but it cleared up later. The last time we explored the Mink Islands, we put in at Dillon Cove. This time we parked and put in at Gilly’s Marina. A very friendly proprietor allowed us to use his slipway to pack the kayaks. There wasn’t much boating activity, so we were able to take our time. To get the most of perishables, Denise kept them in the car in a Coleman cooler with a bag of ice, transferring into our soft-sided cooler bag in the kayak only at the last minute. “What a shame” she said, holding up the half-melted bag of ice. “Strap it on the back” I said. “But the kayak will get all wet” she says. Denise is allowed one such statement per day. The wind of course, is always the wild card on Georgian Bay, and today, it was definitely on the wild side. Snug Island lighthouse marks the entrance to the harbour. 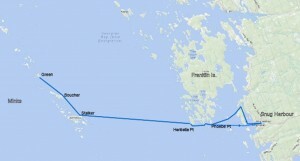 It is about 2.5km from there west across the Shebeshekong Channel to the southern tip of Franklin Island. However, a slightly longer but more interesting (and sheltered) alternative route goes north along the lee side of Snug Island and out the narrow channel at the top end. 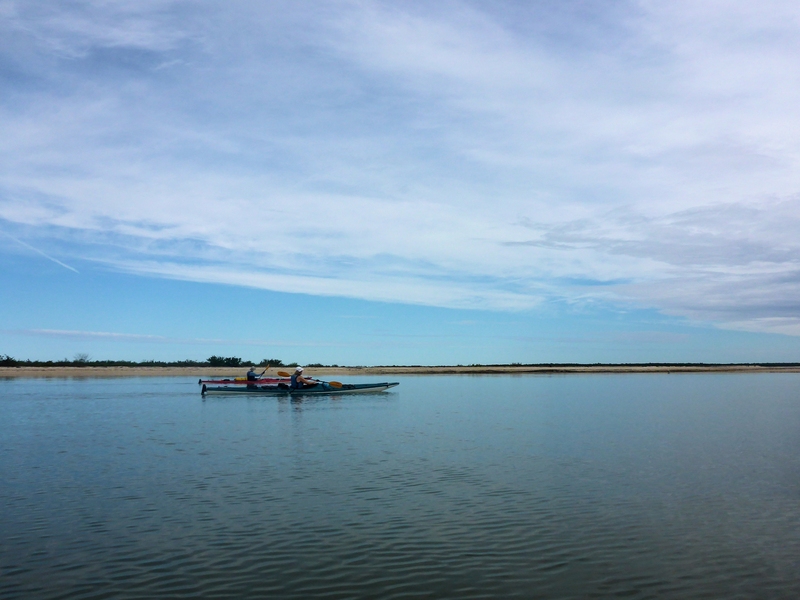 As we paddled up the this narrow passage, we met an older chap coming toward us in a Hobie Cat. I thought he must have been a pretty accomplished sailor to take that thing out in this weather. “Wild ride?” I asked as we passed. “Amazing!” he says, the adrenalin almost popping his eyes out. 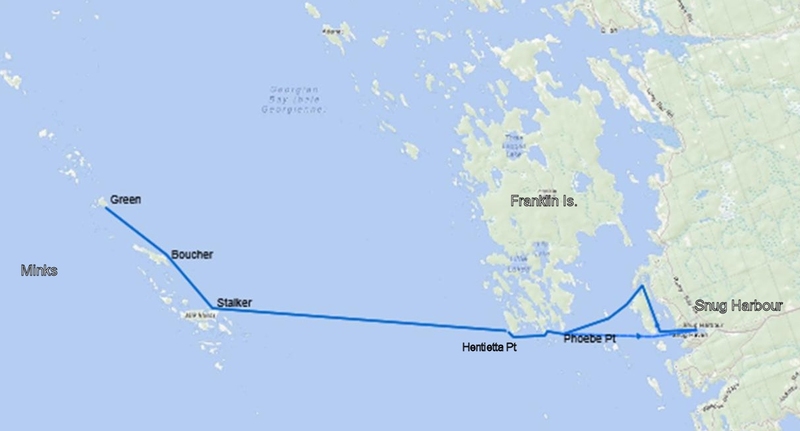 We used the two channel markers (AC1, AC2) at the top of Snug Island and Peachy Island, halfway across the channel, to plot our line over to Phoebe Point at the southern tip of Franklin Island. Even this short hop turned out to be a workout, casting some doubt on the feasibility of a crossing to the Minks. Things got wilder as we worked our way west from Phoebe to Henrietta Point and by then it was clear we were going to have to go with Plan B for the day. Having turned back at Henrietta point, we poked in and out of the various inlets along the southern shore of Frankin, finally settling on a site the would serve as our camping spot for the night. We spent the afternoon sunning, swimming and generally relaxing. This is not a normal occurrence on a McKeown trip. True, my camping list has an item on it that says – “Something to Read”. But almost always, any reading material remains in the hold, secure in its Ziploc bag for the duration. “Ballast” would be a better description. But on this occasion, I actually did get to do some reading. And remember the bag of ice? Well, enough of it survived for Denise to mix up two delicious gin-and-tonics complete with lemon and ice. How absolutely pukka! An early dinner, (another rarity on a McKeown trip) and a pre-dawn start. This might actually have been a first for us – but we figured this was the only way to make it out to the Minks before the wind picked up again. Next morning was calm (by Georgian Bay standards anyway) but it was starting to pick up by the time we were on our way across the 6km of open water to Stalker Island, the nearest island in the Minks chain. The impressive Red Rock lighthouse lies to the south of the chain, so we kept that well to the left as we made our way across. By the time we reached the far side and found a suitable place to land and take a break ( a lot of the Islands at the southern end are in private hands), we had been on the water for about two hours. Although the weather was sunny and about 17°C we were quite chilled and had numb fingers from the extended exposure to wind and spray. A few snacks and sunny rock away from the wind soon sorted us out though, and we were ready for the next leg. Green Island, about mid-point in the chain, was the destination for the day. It was only about 3 km away, but it lay to the north-west – straight into the wind. Boucher Island lies about half way between. Somebody in the party, (we won’t say who), thought we would have a more sheltered ride if we came around the southern side of Boucher. As we arrived at the tip of the island however, we were met with boiling shoals in every direction. 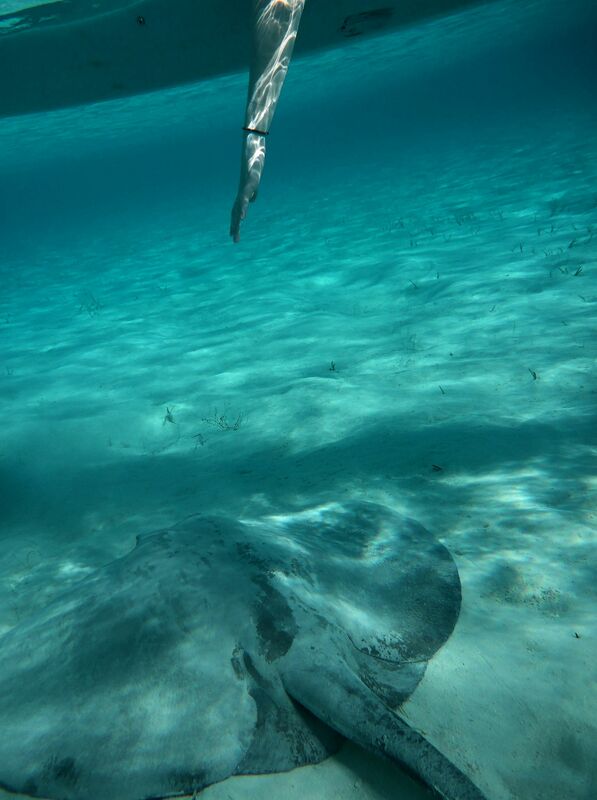 If there was way though without detouring far out into open water, I couldn’t see it. We voted unanimously to turn tail and go round the other way. None satisfied all the specs, but we settled on one that scored well on most. Another leisurely afternoon and a delicious pasta dinner ( definitely have to get Denise to start a blog for camping recipes). Somewhat anxious about the possibility of being wind-bound on the islands, we opted for another early getaway the next morning before the wind got going. We had a free ride back. Winds from NW, just 8 to 10 km/hr. We could have made straight for Henrietta point , with the communications tower at Snug Harbour giving us a line. 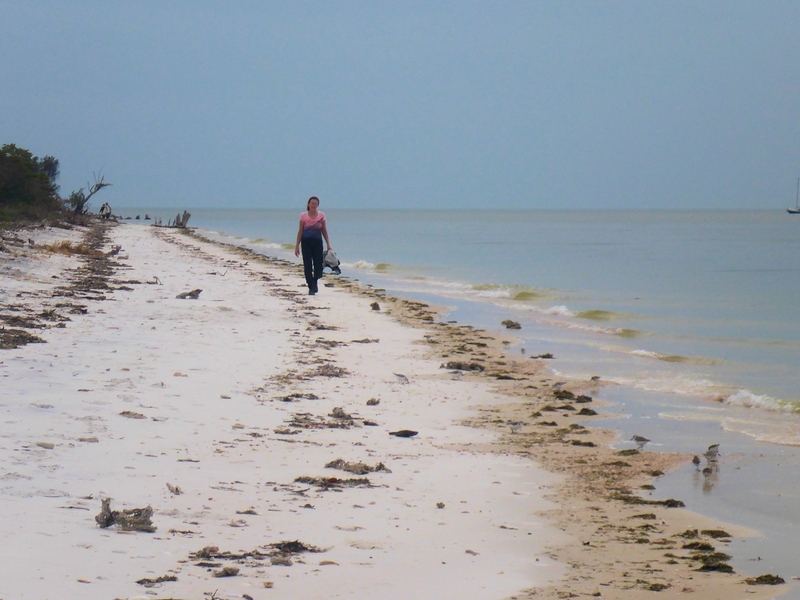 But we decided to re-trace our steps back to Stalker island in order to keep our options open if we needed to get out for a shore break. As we reached Henrietta point, we actually had trouble identifying the spot, so different was it from the inferno just a couple of days before. With lots of time to spare, we meandered in and out of the inlets of the south shore of Franklin once more. 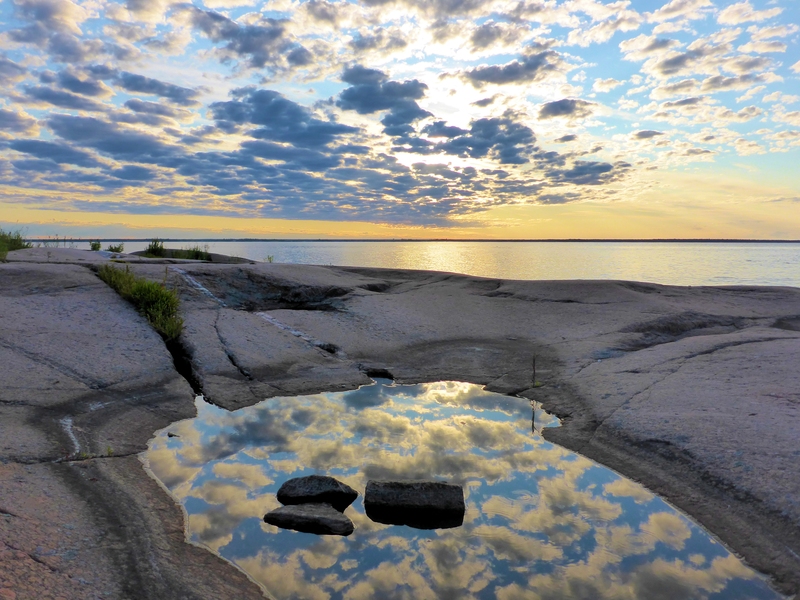 It is amazing how you sometimes squeeze through a narrow gap and find it opening onto an idyllic lagoon, completely still and silent except for the buzz of insects, and the rumble of Georgian Bay just on the other side a ridge. Some more snacks, sunning and watching the dragonflies and then it was time to get back in the boats for the last stretch. This time, rather than take the “scenic” route around Snug Island, we headed straight for the Snug Island lighthouse. Back at the marina, as we packed up the car, Denise suggested we check out Gilly’s Restaurant. A good call. Lovely restaurant. Delicious whitefish washed down with a couple of cold beers. A perfect way to wrap up another adventure on Georgian Bay. We spent Christmas 2013 kayaking in these waters. We liked it so much, we decided it was worth a return visit. 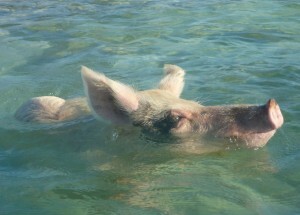 In our previous outing, we ran out of time to visit the swimming pigs at White Cay. So this time, we put this at the start of our trip. 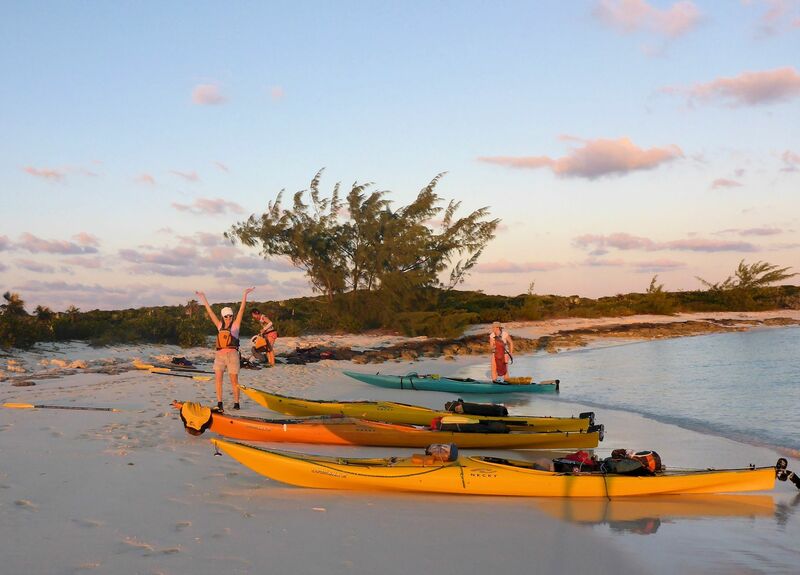 Once again, we relied on the services of Tamara and Dallas of Out island Explorers for kayaks and most of our kit. We got into Georgetown Thursday, staying at Marshall’s Guest House in town. Next morning we met with Tamara and did some shopping in town. Then we did some shopping in town. And then some more shopping. 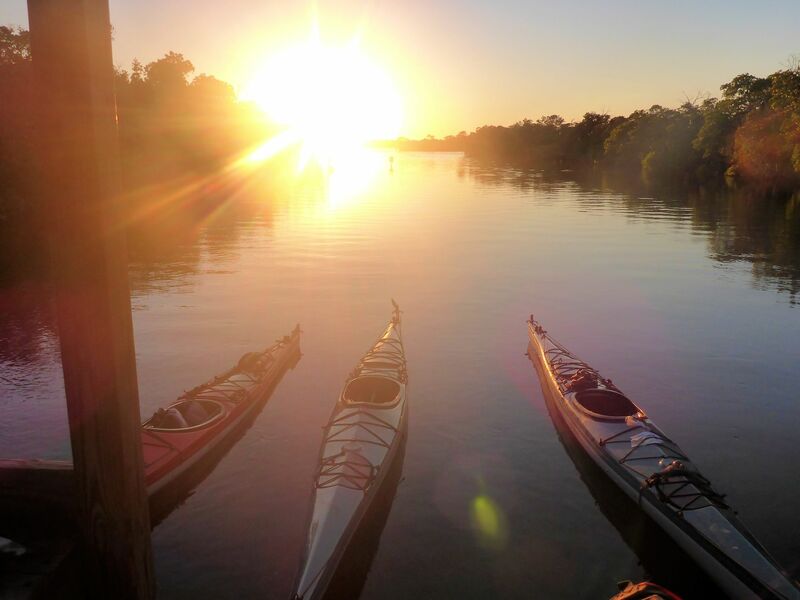 Finally, we picked up the kayaks and headed up to Rolleville. 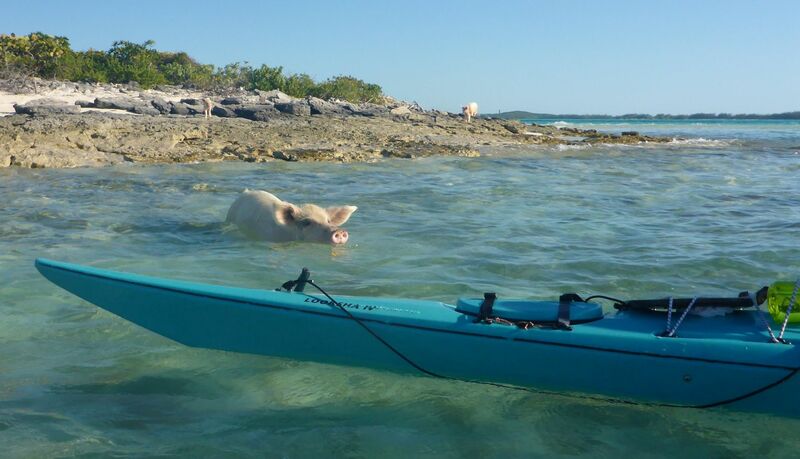 After the mayhem that always accompanies the first packing of the kayaks, we head out to White Cay to visit the swimming pigs. Next morning, a leisurely start. (This was not going to be a mile-bagging trip by any stretch of the imagination). We finally got packed up and continued on our way up to Rat Cay. Last year, when we stayed on this island, we could clearly see hoof prints on the beach – evidence of a resident pig, although we never actually saw her. This time however, she was there in person, and managed to make quite a nuisance of herself. To the point, in fact, that we decided we had to pack up and find alternative accommodation. 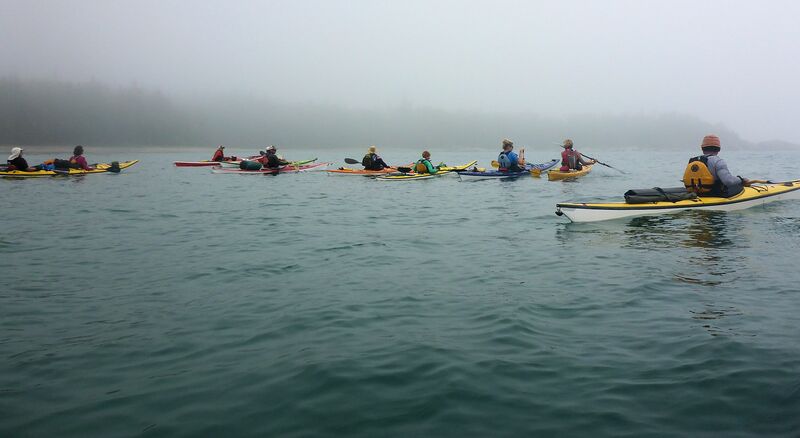 Plan B was only a short hop over to Pigeon Cay, but it was dark by the time we got everyone back in the water and across to the other island. There is not a lot of real estate on Pigeon and there were a few tense moments as we tried to agree on a suitable spot for tent and kitchen that would be above high water mark. As it was, we were on the neap tide and the squeeze wasn’t as tight as we feared. 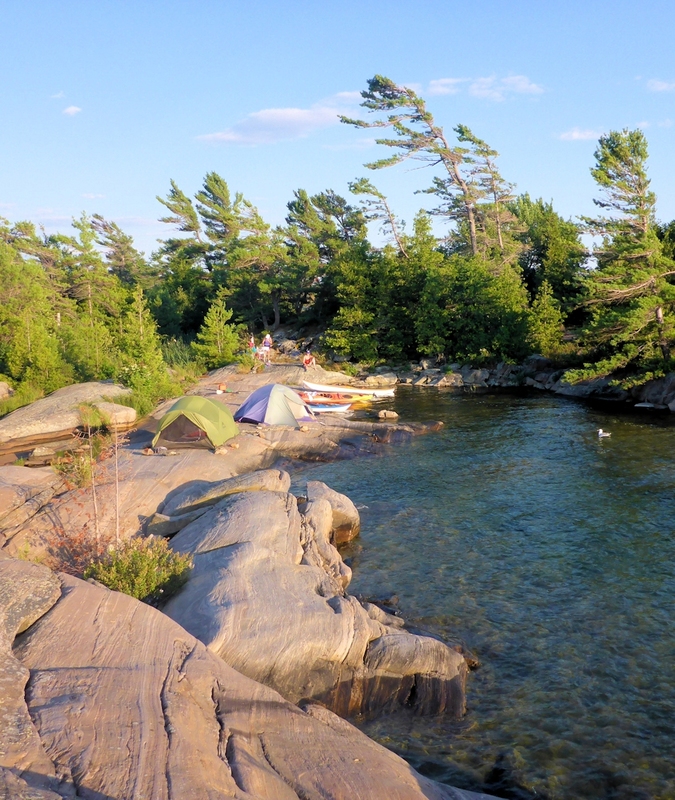 Next morning we packed up and resumed our journey north to Lee Stocking Island. On the way, we stopped off at a tiny beach on Windsock Island. As we had our snacks, we were approached by two couples in a small dinghy. 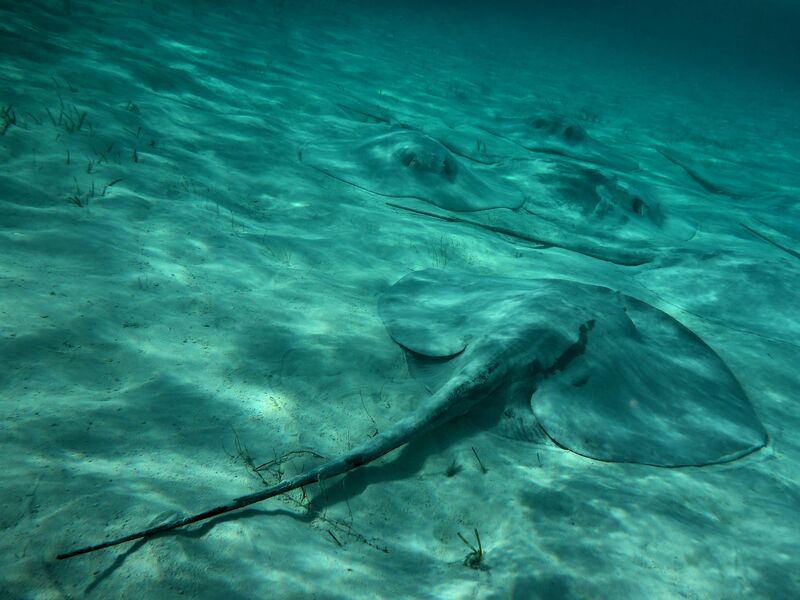 They were touring the cays by sail and came over to tell us about the school of stingrays just off shore. 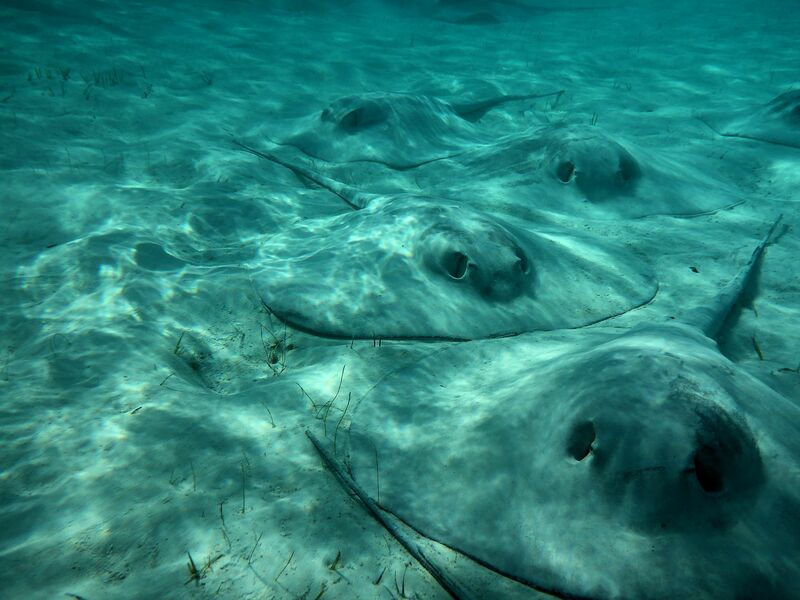 After comparing notes, we headed over to the bay they pointed out, and sure enough, we encountered a huge school of rays in the shallow waters. Almost, but not quite close enough to touch……..
We dallied with these strange prehistoric creatures for quite a while before finally setting course for Lee Stocking, and Twin Beaches. Unfortunately, the beach also seems to be a popular spot for day trippers from the Sandals resort at Emerald Bay. Our little haven was invaded twice. But they stayed only long enough to take a look at the cliffs and were off again. Next day we took a short paddle up to a nearby beach. There are trails tucked away at each end . The one at the left leads up to Perry’s Peak. 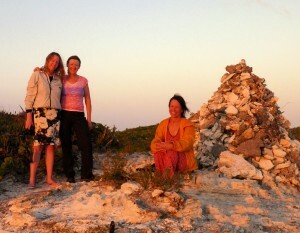 The “highest” peak in the Exumas. Only 123′ high, but enough to give a good view of the surrounding countryside and the wonderfully-named “Tug and Barge” rocks in the distance. The other, longer trail, from the northern end of the beach, led up to an abandoned marine research centre. Once known as the Perry Institute for Marine Science. Perry was a founder of the NOAA in the US. I assume the peak was named for him. The trail leads out onto an airstrip. The old hangar and maintenance sheds are strewn with bits of machinery and parts. it struck me as a great set for an episode of the X-files. We would have spent more time poking around, but it was getting late and we needed to get back to the boats. Back at the beach, we were greeted by another party from Sandals. Things are definitely busier on this side of the Exumas. Last year, we started out in the Brigantines and went four full days without as much as a sign of human activity. We decided to spend our last night back on Levy. That left us with a short hop back to our take out at Rolleville. Murphy’s Law of course – the wind had swung round 180 degrees by now, so we had it in our faces going out and coming back. As it was though, we had little cause for complaint. The storm front that threatened to play havoc with the last leg of our trip held off until we were safely back in the hotel. 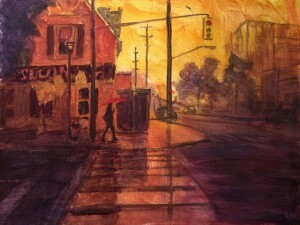 The Second Cup coffee shop at Lakeshore and Stavebank is a bit of a landmark in Port Credit. It caught my eye once before – a long time ago and under very different lighting conditions. On this occasion the lighting is flat. The back-lighting reflects the sky onto the pavement. 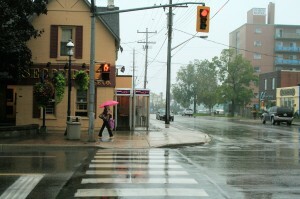 The cross-walk, and the reflections on it, provide a nice lead-in to the woman with the red umbrella. She is not in the original photo. I borrowed her from another shot. Quick tip: If you are gathering material for a street scene, take lots of “people” shots on the same day. Figures will seldom be exactly where you want them in you composition so its handy to have an inventory of people shots taken from the same locale, under the same lighting conditions, to insert as needed. You can do so literally (by photo-shopping them in) or just by sketching them in and having several photos arranged around your easel as reference while you paint. Figures borrowed from photos taken on a different day will seldom sit as comfortably in your scene. As I work on the underpainting, I am thinking ahead to the final piece. For instance, I made a mental note that the façade of the coffee shop is not uniformly lit, despite the flat lighting conditions. The top right is distinctly lighter than the lower left. 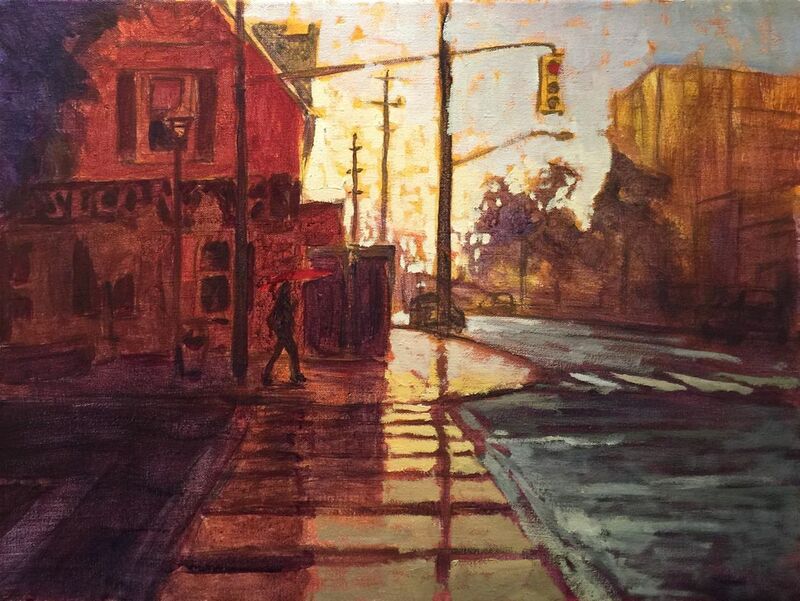 The cross-walk shows reflections from the coffee shop and the phone booths of course. But even the sections in full light are not uniformly lit. 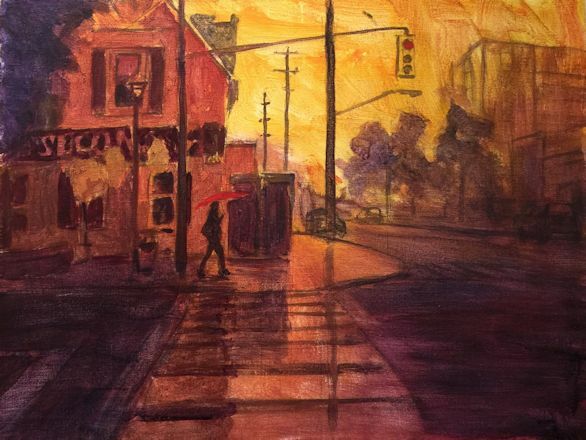 It is more intense near the sidewalk and fades as it comes closer to the viewer. It is barely noticeable in the photo, but if I exaggerate it a bit, it may draw the eye in more dramatically. The building on the right, I want to push back into the distance – more so than appears from the photo. Doing this will add to the atmospheric effect I think. 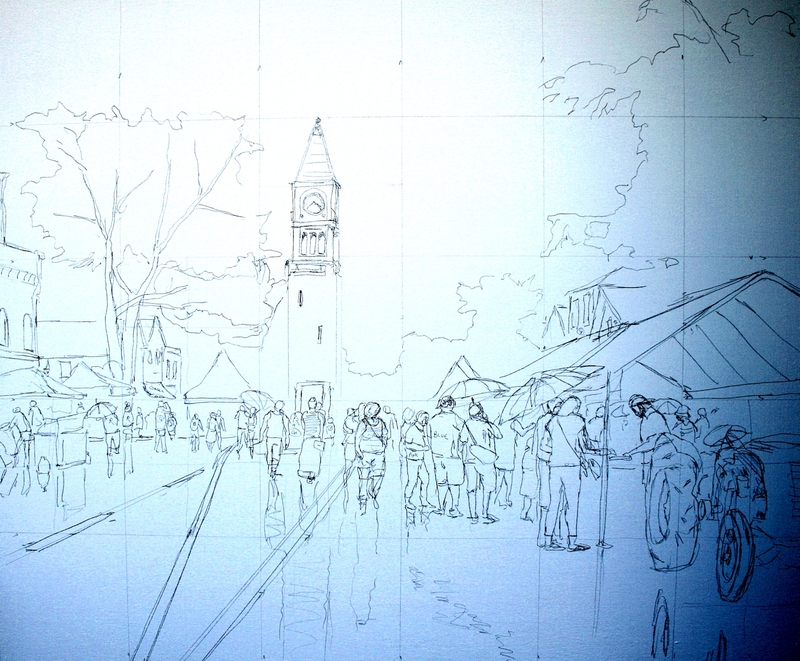 With this in mind, I don’t go as dark with the underpainting of this building as I otherwise might. Once you’re done going dark, it’s time to get bright. 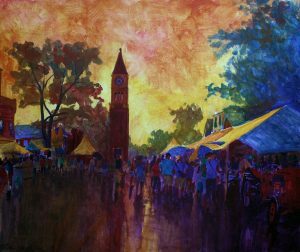 When you start to work on a dark canvas, any paint you apply can look bright – almost white. So it’s often a good idea to start the next stage at the brightest spot. The lower sky in this case. Once these lights are established, gauging your mid-tones will be much easier. The sky, bottom left, is almost pure lemon yellow and white, with the merest traces of cad red and cobalt blue. In the other corner, the sky is a deeper blue-grey (cobalt blue; touch of Cad Red). How do you go from lemon yellow to cobalt blue without getting green in between? The secret is to blend visually rather than literally. If you juxtaposition very pale tints of each that are of identical value, the eye will not perceive the transition. 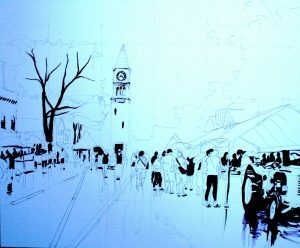 Once safely over on the blue side, you can then proceed to deepen the colour as needed. The finished piece. Getting the “right” value and colour temperature for the façade of the coffee shop was important. The red umbrella acts as a natural focal point. To give a hint of reflected light from the umbrella, I also added a few tiny swatches of red around the face and arm (or where they would approximately be in a more detailed painting!). A big Thank You to Karen for the in-progress shots! In Spanish, “cajon” just means “box”. In English however, it refers to a box drum. 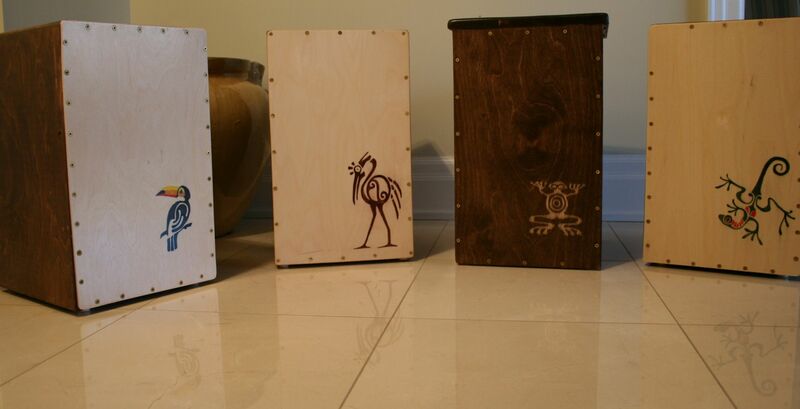 It originated in Peru, where black slaves used shipping crates as improvised percussion instruments. There are lots of stories about the banning of traditional African instruments and so on, but my guess is that these are fanciful myths. More likely, the cajon is just another example (like spoons and washboards) of the long tradition of poor people using whatever is at hand as percussion instruments. 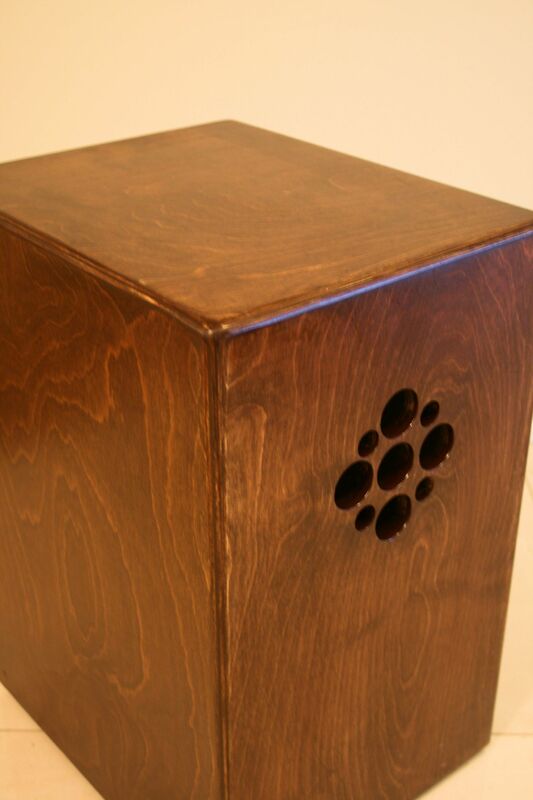 Cajons have become popular today because they do a good job of mimicking a modern drum kit, but at volume levels that are easier to manage when accompanying acoustic instruments. More portable too ! Today’s cajons are a far cry from their humble shipping crate origins. 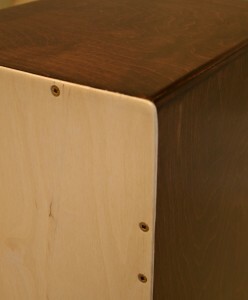 They are still ‘just’ plywood boxes, but usually made today of top grade Baltic birch, sometimes with elaborate veneers. The playing surface (the “tapa”) is extra-thin (1/8th inch) 3-ply. And of course, you need a sound hole. Usually at the back. It doesn’t seem to matter much whether it is towards the top or bottom. But closer to the top means you also have a convenient way to carry the thing. It can be a simple hole, like a guitar sound hole. Or you can get a little fancier. The tapa is always attached with screws rather than glue. Two reasons. One, it allows you to get at the inside if you need to adjust the snare (more on this below). And, you can also experiment with backing off some of the screws at the top to provide a “snap” sound like a rim shot. You usually see screws omitted from the top corners of commercial cajons for the same reason. Traditional Peruvian cajons do not have an internal snare. Most examples you see in contemporary settings do. Sometimes these are just guitar strings stretched behind the tapa to create a ‘buzz’ sound when tapa is struck. The better answer I think, and the one I used in all the above, is to use an actual snare drum snare. However, it is not stretched across the back as it would normally be. Instead, you cut the snare in two. Attached to a cross-brace, the snare wires lie against the top section of the tapa like a brush. In each of the above instruments I experimented with the amount of snare – much like the plywood – going from a lot, to a little, and finally settling on an amount that seems about right to my ear. Then of course, there is the art work. 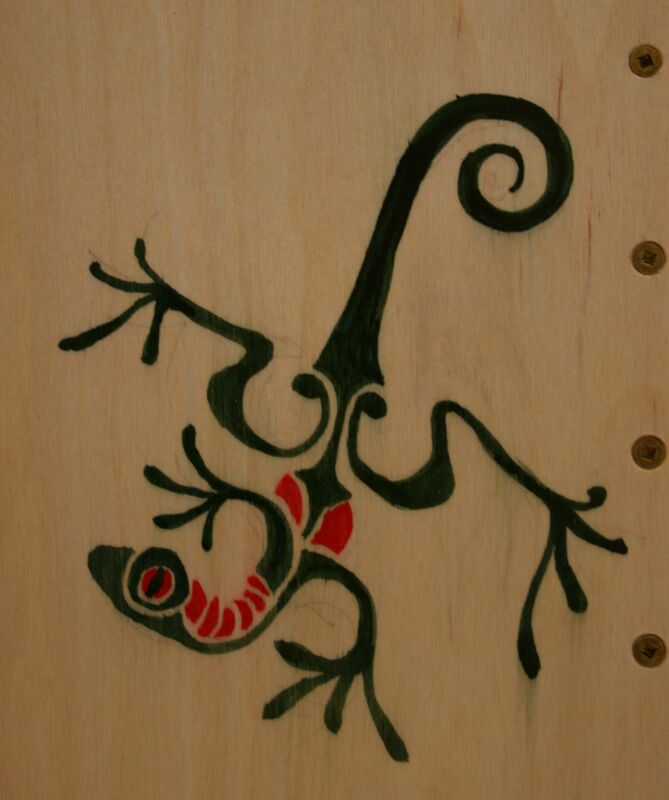 Each is an original, but all draw heavily from traditional Inca/Mayan motifs in honour of the drum’s humble origins. Check out Heidi Joubert on You Tube to see an expert player in action (and some lessons).